To all boxing fans, does the word "Bantamweight" ring a bell? (pun intended). 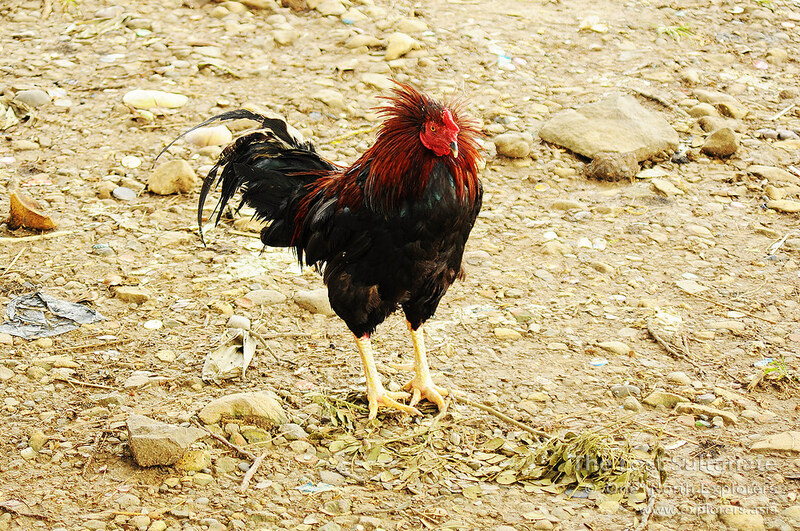 A class used for boxers who are smaller in size, the "bantam" in "bantamweight" is actually derived from the Bantam Chicken, a small variety of poultry. European ships, which often stopped by the Sunda Straits en route to the Spice Islands, would call at the port of Bantam (Banten in the local tongue) to restock their supplies. They found a small breed of chicken sold in the markets of Bantam and it came to be known as a "Bantam" or "Bantam Chicken" after the port city. aggressive when disturbed and a real force to reckoned with. Strategically located in the northwest of Java, the Sultanate of Banten had some of the busiest ports of the 16th century as numerous Europeans came to the Indonesian archipelago looking to dominate the spice trade. Banten was actually founded by Sunan Gunungjati or more popularly known as Fatahillah, a well known figure in Indonesian history. He is credited as the man who first spread the religion of Islam to Java and Sumatra, which were largely influenced by Hinduism at that time. After defeating the Kingdom of Sunda, he chose Banten as the regional centre of his Sultanate, the first Muslim Sultanate ever established in the East Indies and established the centre of his kingdom in the northwest of Java. The first Dutch fleet, led by explorer Cornelis de Houtman, first called at Bantam on its expedition to the archipelago in 1596, before it went on to explore other parts the Spice Islands. de Houtman was eventually killed during a skirmish with the Sultanate of Aceh's navy, which was led by the legendary female admiral Malahayati. After going through the trials and tribulations of the sea voyage, the original crew of 249 men had been reduced to 87 by the time the ship returned to the Netherlands. Despite this, it was perceived as a symbolic victory for the Dutch as it meant that they had found a way to establish a shipping route to wrest control of the spice trade in Europe away from the monopoly of the Portuguese. The Dutch East India Company was set up in 1602 and it gradually dominated the spice trade in the East Indies by setting up a trading post in Banten. Following this move, the British followed suit and they were soon joined by the Danish as well. 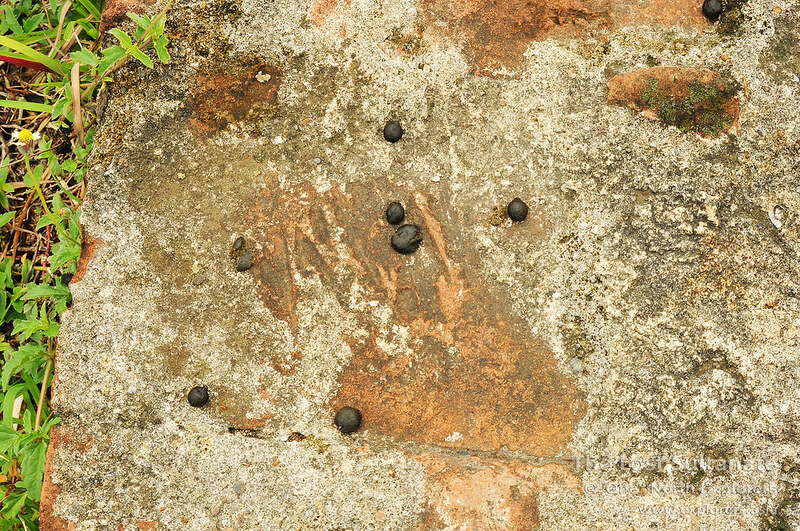 Banten had traditionally been strong in the pepper trade since the early days of its founding as its second Sultan - Mulana Hasanudin - cleverly established his foothold on southern Sumatra, where the bulk of pepper production came from. The wealth generated from the trade of pepper alone made the Sultanate of Banten one of the most richest and powerful Sultanates in that era. At one time, the Sultanate comprised almost all of Sunda - the entire western end of Java - and all of southern Sumatra as well. However, the Sultanate started to decline after the Dutch arrived. The VOC (Dutch East India Company) conquered the port of Jayakarta from Bantam after conflicts arose over both parties over the pepper trade in 1619. The Dutch Governor-General, Jan Pieterszoon Coen, then founded Batavia (present-day Jakarta) on the ruins of Jayakarta and it became the center of the VOC's operations. Batavia had become a serious rival for Bantam. There were also several armed conflicts between the Sultanate of Banten and the VOC during the middle of the 17th century which weakened the Sultanate further. In 1752, the foothold of the Sultanate in southern Sumatra was lost to the VOC. The Sultanate was subsequently annexed by the Dutch Governor-General, Herman Willem Daendels, in 1808. The 18th Sultan of Banten, Aliyuddin II, was captured when he refused to cooperate in his orders to shift the Sultanate to Anyer following the commisioning of the construction of the Great Post Road by the Dutch Government. To top it off, the Dutch envoy who was sent to Bantam to deliver this message was beheaded by the Sultan and his head was sent back to Daendels, a move that incensed the Dutch further. Daendels commanded a force which greatly outnumbered the Sultanate and stormed the grounds of Banten. 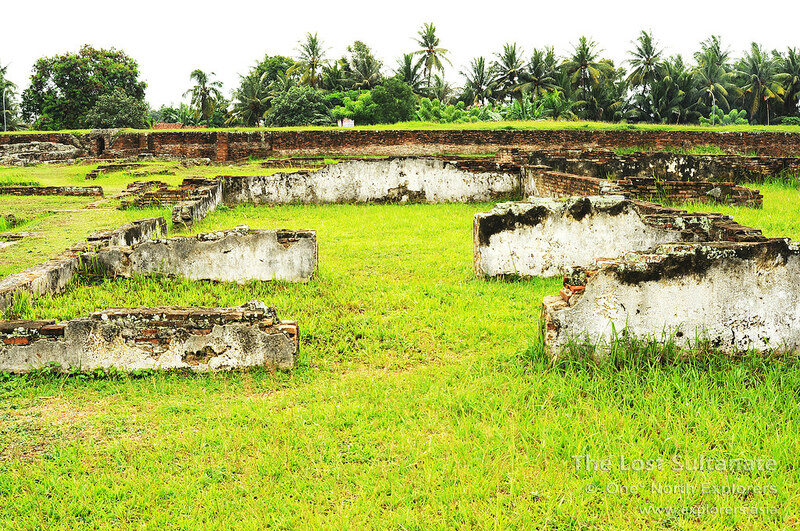 The Surosowan Palace (known as the Keraton Surosowan in the local language), long occupied by the Sultans of Banten since the start of the empire, was also destroyed by the Dutch forces as a result of the invasion. The Sultanate finally came to an end in 1813 when the last Sultan of Banten, Muhamad Syafiuddin, was forced to relinquish his throne by Sir Stamford Raffles - the Lieutenant Governor of Java - following the Dutch's capitulation to the British in the Java campaign. The Sultanate of Banten lasted from 1527 to 1813. 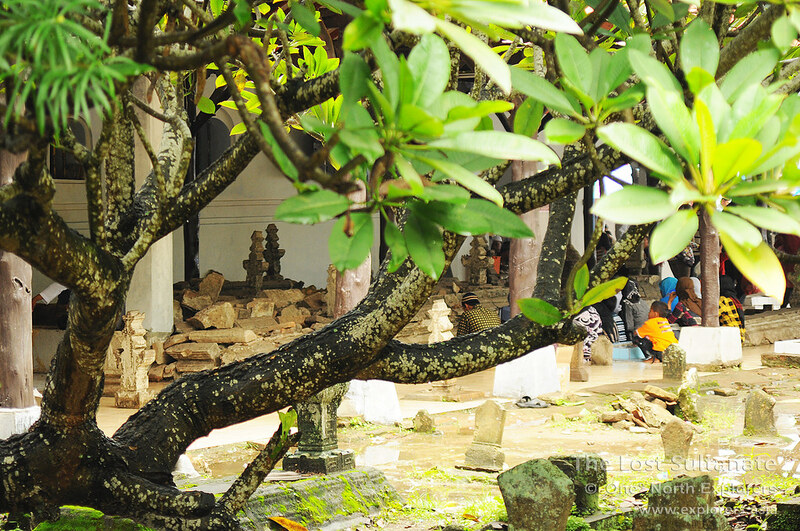 The rich history of Banten, and the fragments of the past which remain, were certainly worth visiting. 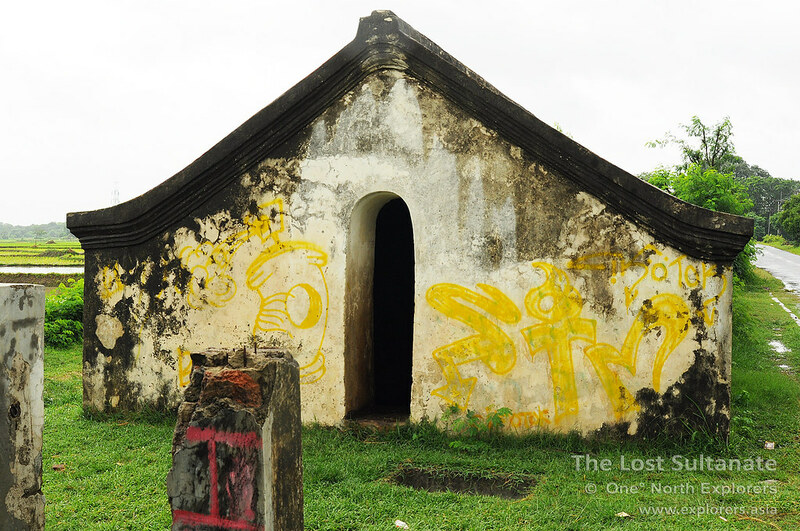 In order to narrow down on the traces of this lost Sultanate, I knew I had to visit the former seat of power in the northwest of Java. 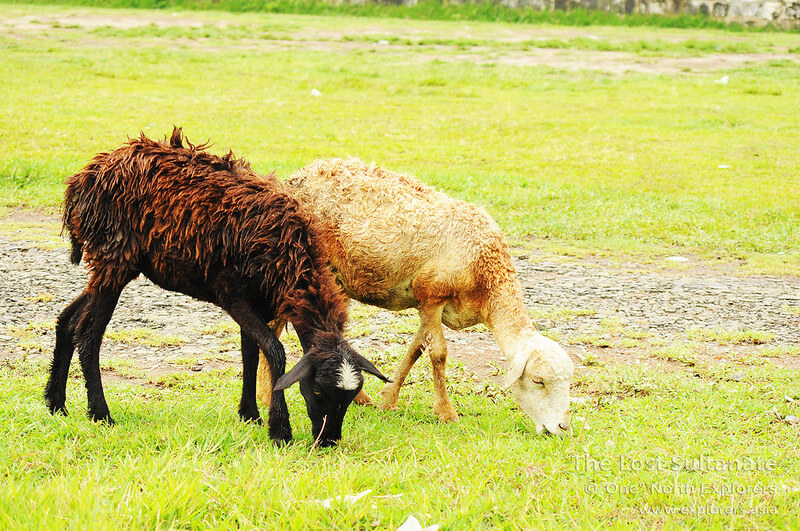 The capital of the Sultanate of Banten is located in the vicinity of the present day "Banten Lama" or Old Bantam, in the Serang Regency, a two hour drive from Jakarta. Before I embarked on my journey, I asked Hardi - a local nature / exploring enthusiast and personal friend of mine - if he would like to join me in this little adventure a few days prior to my planned trip before. He replied "Of course!" emphatically before I could say Jabodetabek. With Hardi's immense knowledge of local history and culture, as well as his fluency in the Sundanese and Bantenese languages (the most widely spoken languages in Banten province), I knew I was in good hands. We had also been exchanging stories and our exploration experiences prior to this trip so I knew Hardi was a pretty experienced explorer in these parts. Needless to say, I felt thankful for having a seasoned local joining me on my maiden trip to Banten province. and a smattering of German. Our drive from Jakarta to Serang was largely uneventful, save for the occasional buffalo or goat grazing by the roadside. When we entered Serang, the roads were flooded in some parts due to the rain in the previous evening and that slowed things down a little. En route to Surosowan Palace, our first destination, we passed by an old colonial bridge in Banten Lama which ran parallel to the new steel bridge which facilitates traffic across the Cibanten river. "This bridge was built by the sweat and blood of the Indonesian people as part of the Jalan Raya Pos as directed by Willem Daendels. Many died during the construction of the road." said Hardi. The Jalan Raya Pos, (Der Grote Postweg in Dutch) or the Great Post Road is a 1000 kilometer stretch of road connecting Anyer in the west of Java and Panarukan in the east of Java. 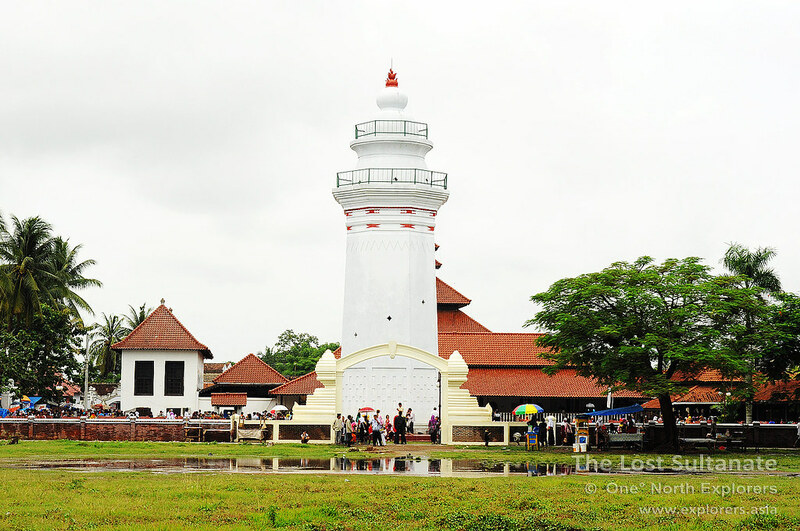 It was built mainly for military reasons as a main supply route to protect the northern Javanese coast against the threat of a British invasion. As Hardi had pointed out earlier, many had died in the construction process, which took just a year to complete. during the construction of Der Grote Postweg? 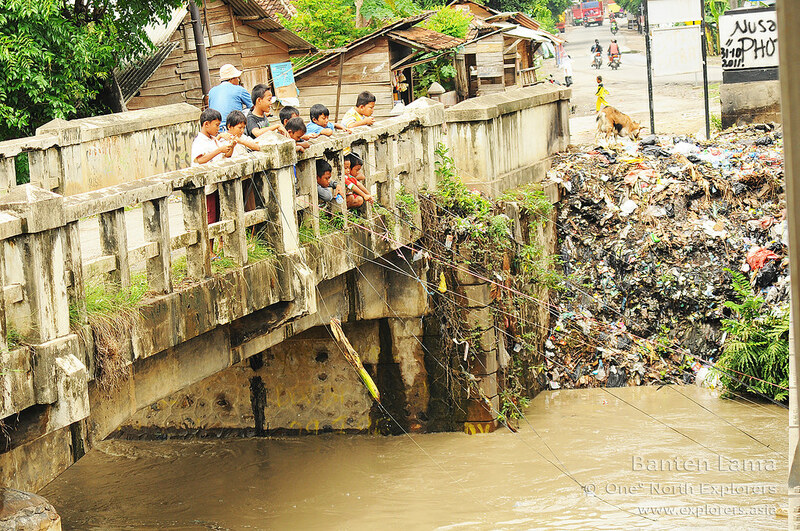 Kids on the bridge playing with plastic bags tied to ropes, pulling them against the current. The Cibanten's flow seems pretty much stronger after the rain. I wonder how many bags they've lost. After a short drive past beautiful padi fields flanking us on both sides, we arrived at the outer walls of Surosowan Palace. 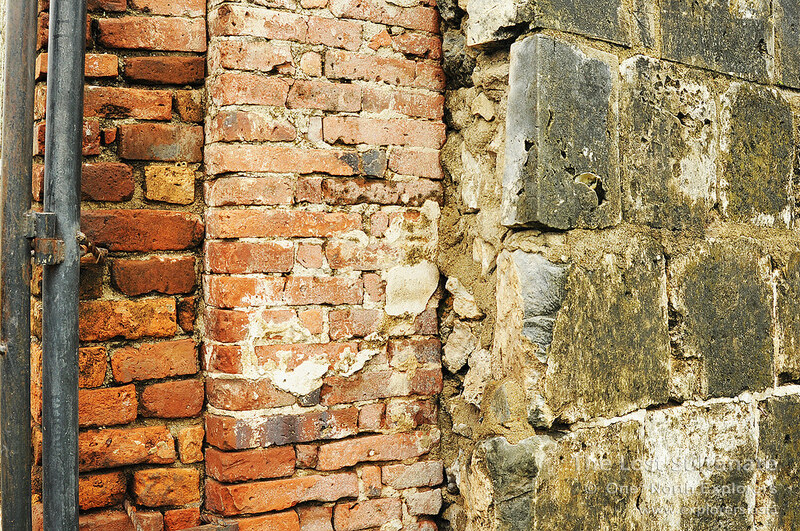 I was stumped by the beauty of these age-old walls. The faded stone walls must have seen so much over the last half few centuries, a silent witness to the glories of the former Sultanate. 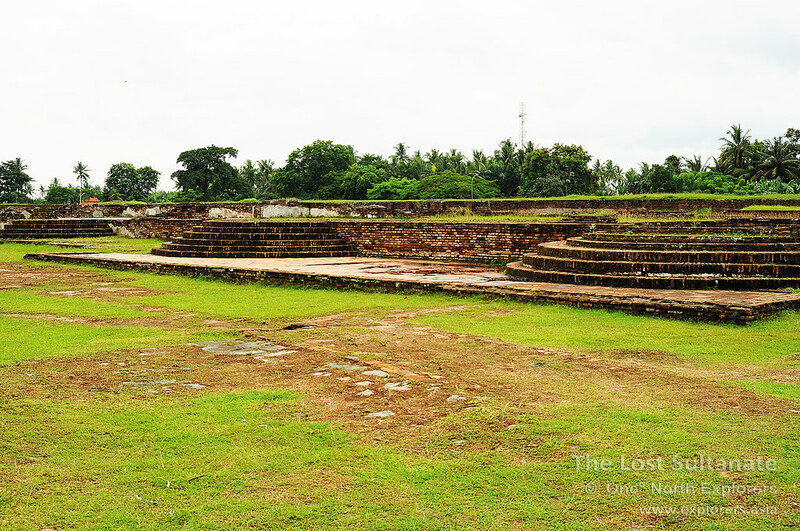 Surosowan Palace stands in ruins today, a pale ghost of its former glory. The palace was partially destroyed during the Dutch blitzkrieg on the largely outnumbered Sultanate of Bantam, and after the Dutch overran and occupied the area, William Daendels made his madcap plan to tear down the palace. The significance of the palace and its association with the royal family gave the Dutch enough reason to destroy it completely. 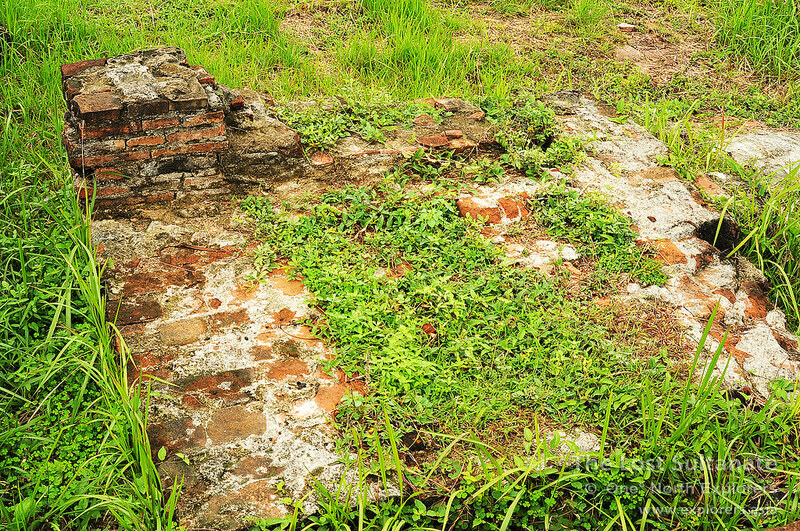 A new Dutch government building was then constructed in Serang using the bricks and other materials cannibalized from the ruins of the palace, stripping it to its bare foundations which we see today. This Dutch building is now the Governor of Banten's Office in Serang, a town about 10 km from the ruins of Surosowan Palace. were employed in the construction of the palace. Hardi added this haunting sentence as we walked towards the entrance of the palace ruins: "Whatever the Dutch could use, they took. Whatever they couldn't, they burnt it to remove it altogether." 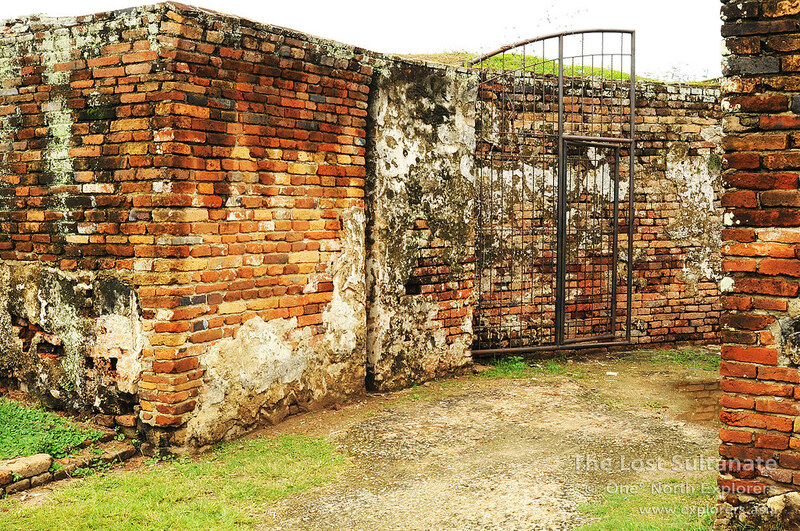 When we approached the iron gate which granted access to the hallowed ruins, I noticed that the stone wall which encloses the palace had 2 layers - a thinner outer layer seemingly made from stone and a thick inner layer made from brick and mortar. "Ah, I see that you've noticed." said Hardi. "Come closer, let me show you something interesting." We went even closer to the wall. "Look at this." said Hardi as he pointed at a part of the outer wall. It may look like a regular stone wall, but as i looked where Hardi was pointing, it became evident that the wall was anything but normal. I inspected the lighter-coloured material which he was pointing at. The wavy patterns on the surface only reminded me of one thing on earth that could look like that. "Is that a piece of Coral?" I asked. "Yes. Batu Karang (Coral)." It turns out that these were no mere blocks made from stone but instead they were made from coral rag (a rubbly limestone composed of coral reef material material). The reason for the employment of coral rag was simple enough. Corals are strong and tough enough to withstand the weather and since dried up coral reefs are usually huge in scale around the archipelago, it is much more easier to obtain and therefore cheaper than conventional materials such as stone. 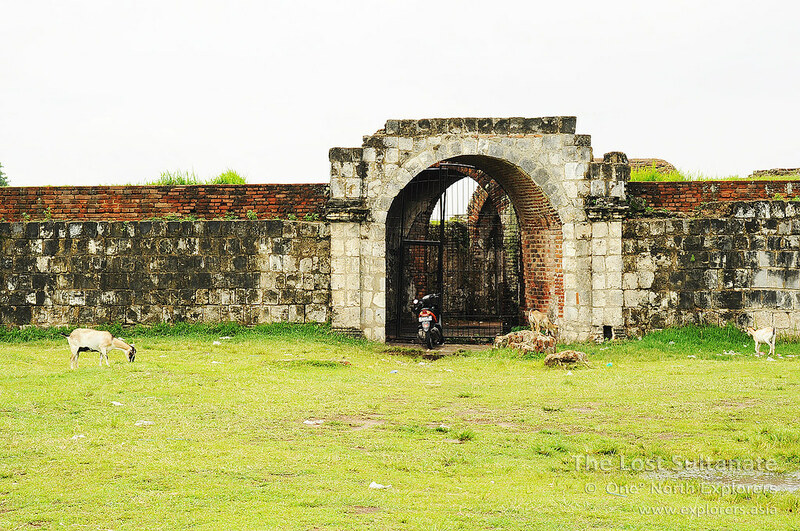 Stepping through the gates, I had my first glimpse of the palace ruins. It was hauntingly beautiful. Hardi was visibly excited at this point too as he started walking around, taking photos for his own collection. I followed suit, wanting to capture as much of this beautiful place as I could. 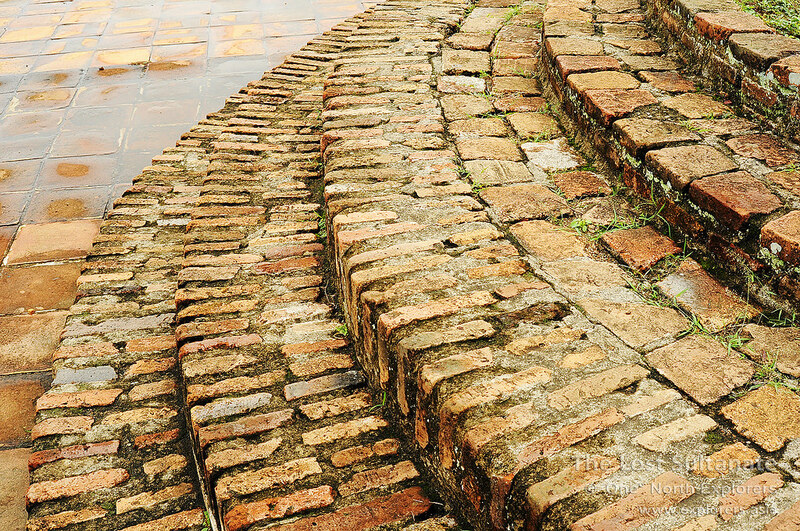 Red bricks leading up to the portico. Broken pieces, just like that of a jigsaw puzzle, waiting to be solved. 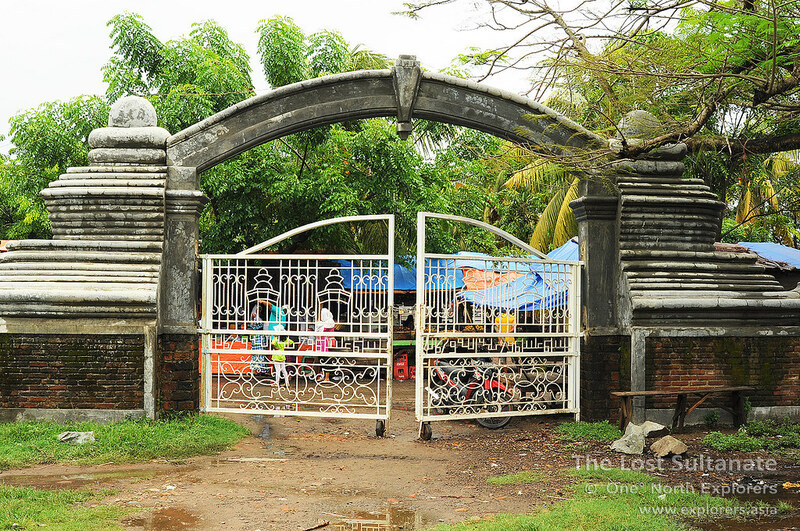 When Maulana Hasanudin was appointed as the second Sultan of Banten, the palace was only a simple building surrounded by a fence during his reign (1525-1552). The additional buildings, fortifications and features were added later by the long line of Sultans. The palace has been refurbished at least five times, and it was even destroyed in a civil war between Sultan Ageng Tirtayasa and his son, Sultan Haji, and rebuilt later. The two were known to be loggerheads over the latter's insistance to cooperate with the Dutch while the former chose to refrain from working with foreigners. Following this war which Sultan Haji formerly won, his efforts to restore the broken palace proved to be futile as unhappy subjects broke down the palace once again over their dissatisfaction with his actions. 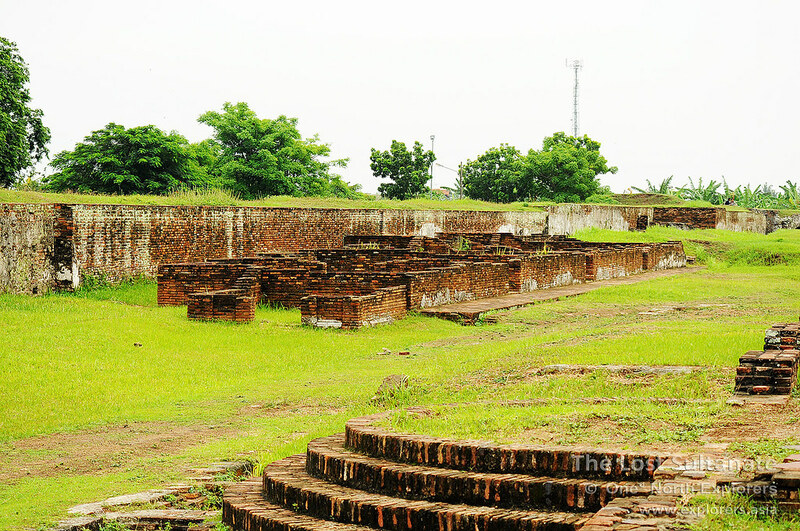 The silent ruins of the former royal palace of Banten have so much to tell. The palace's additional features are often attributed to Hendrik Lucasz Cardeel, a Dutch architect who later converted to Islam. He proposed the addition of bastions above the fortification wall and several other European inspired features. In fact, owing to the Europeans' love for water features, the various fountains and baths in the compound may have also been his idea. Since it was destroyed in 1808, no one really knows how the palace really looked like. 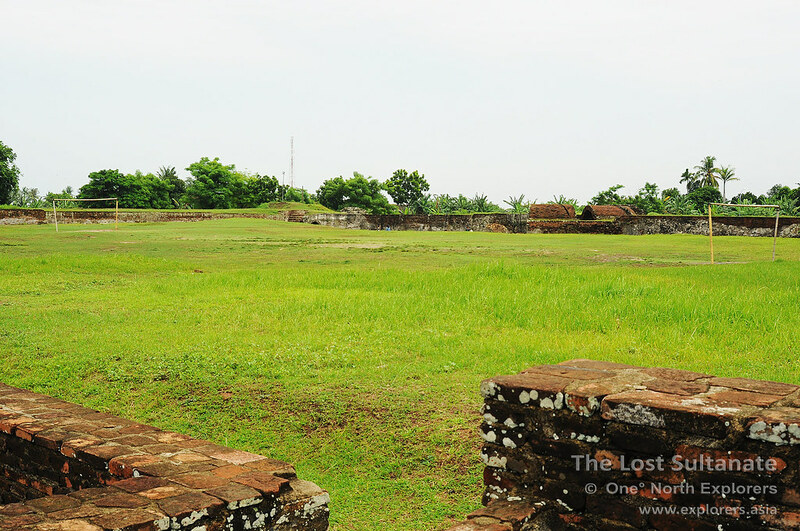 It is believed that the Palace covered an area of some 30,000 square meters with walls that ran 2 meters high. 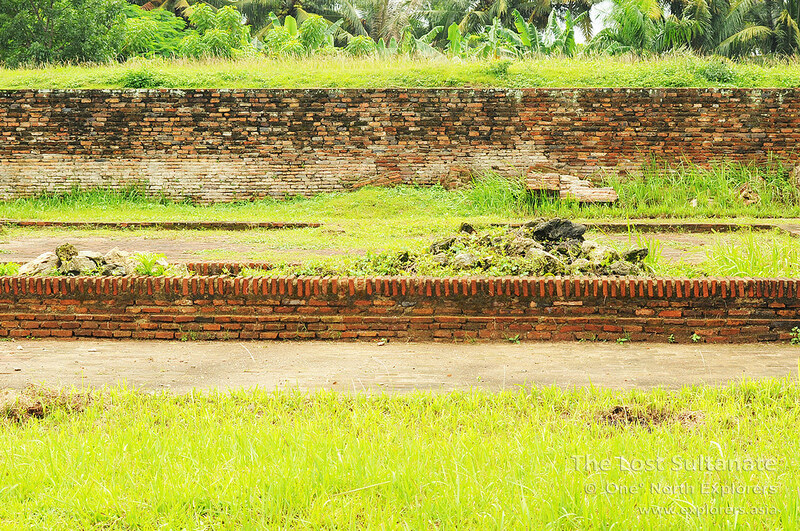 A moat also used to encircle the palace to defend it against invaders and it was said to be so wide that a small ship could sail through it en route to the Java Sea, a short distance away from the palace. One of the former halls where the Sultans received guests. 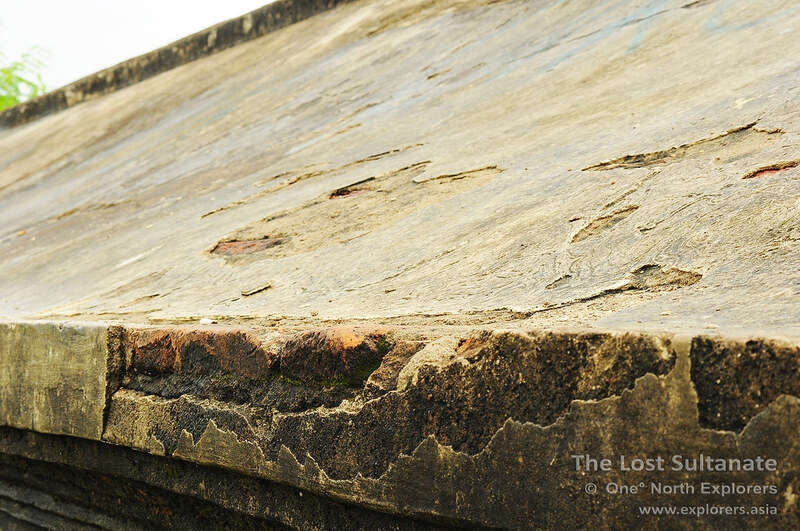 The original terracotta tiles are still pretty much intact. A few key features of the palace, which still stand their ground today, gives us a precious look at how sophisticated the royal architects and engineers were. 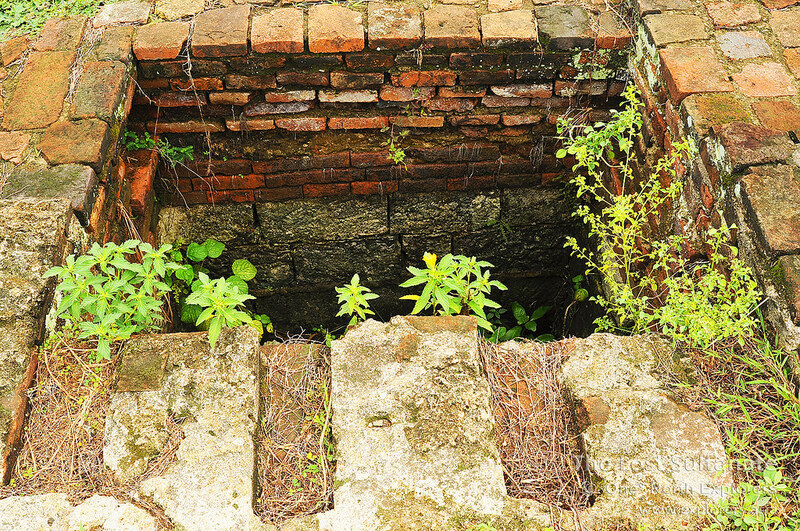 The infrastructure of the palace was ahead of its time, where a complex network of culverts ensured that fresh water was supplied to the palace at all times. 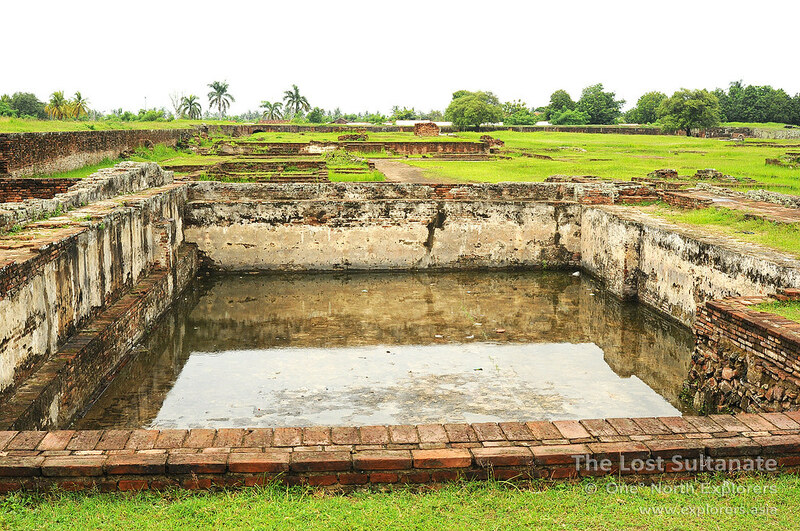 The palace also has a series of pools where the occupants could bathe leisurely. 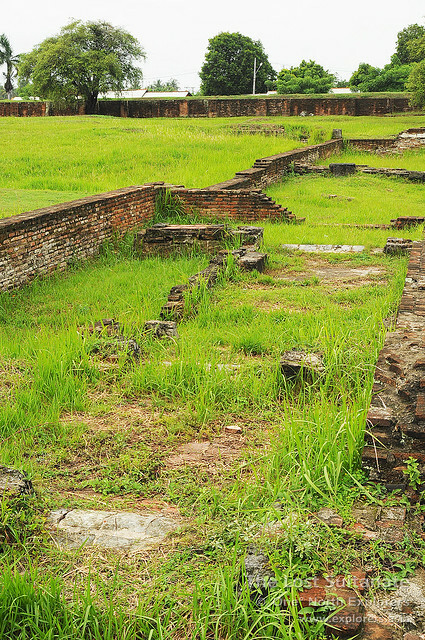 These ruins in the background are believed to be that of the royal kitchen. Who knows what gourmet dishes were created here for the tasting pleasure of the royal family? Stepping through the gates, I noticed that the entrance was curved, a most unique design. This was to prevent outsiders from looking into the palace area. Also, in the event of war, the curved entrance prevented opposing forces from firing hand-held ranged weapons directly at the palace. 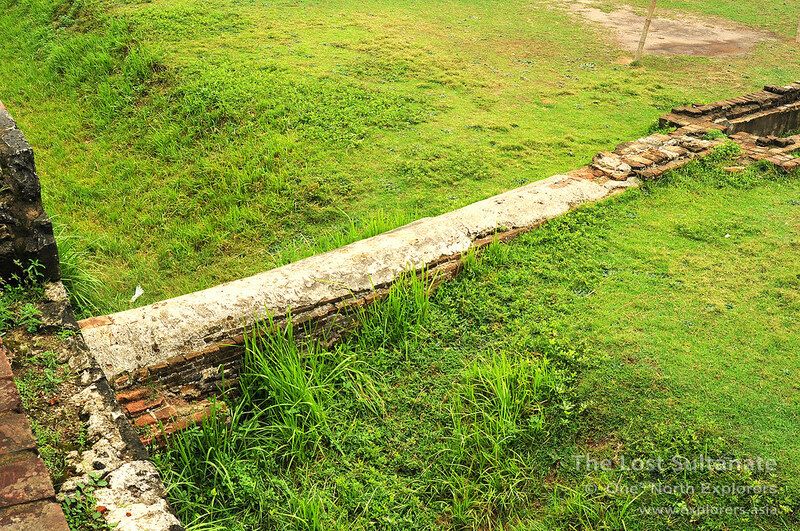 The entrance to the ruins of Surosowan Palace. A closer look at the curved entrance. As we entered from the south entrance, we were in closest proximity to the grand halls and bedrooms of the royal family. Hardi drew my attention to one in particular - the Queen's chambers. Apparently her bedroom had a large concave space underneath the floorboard where water would run through, drawing heat away and cooling the temperature in the room. However, this feature has since been covered by earth and overgrown with weeds. The Queen's Chambers lies in a crumbled mess. A part of the Queen's Chambers. A small bathroom, perhaps? 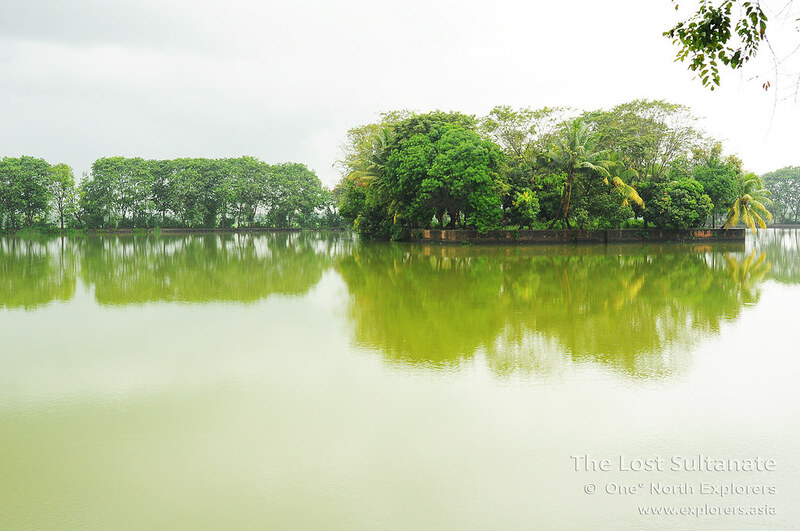 "The water supplied to the palace is actually from a small lake called Tasikardi. It is located not too far from here." explained Hardi as he led me towards an open square-shaped hole in the ground. I looked into the hole. 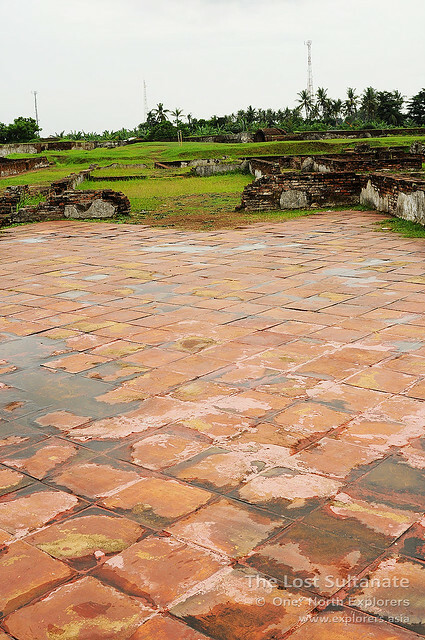 It had a flat bottom, making it a void shaped like a rectangle, and was lined with the same red bricks found around the palace. 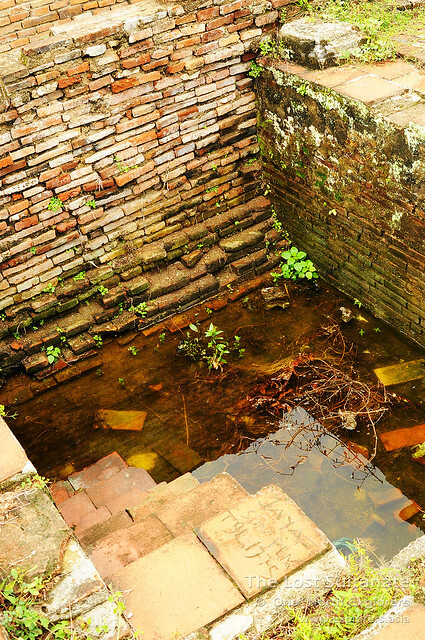 "This is actually one of the many purification filters in the palace. You can see an inlet over here and an outlet over here." Hardi pointed towards two holes on opposite sides of the filter. It seemed to be either a sediment type filter, or, more likely filled with gravel and sand to block off any impurities while running water passed through. The two grooves you see in the photo above were used to channel rainwater into the filter as well. 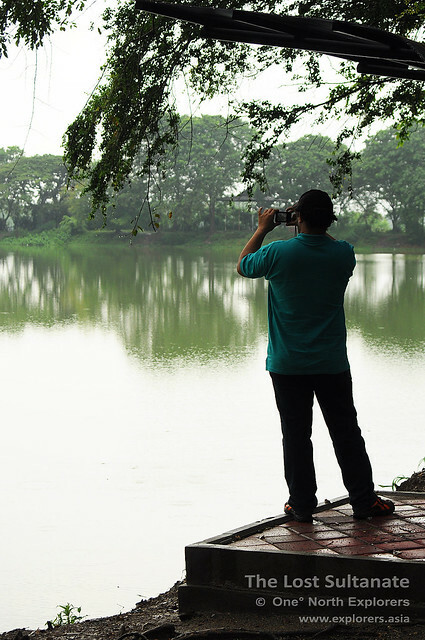 From the number of filters, we could see how water was a going concern for the palace. There was a large pool near to this filter, measuring 30 meters long, 13 meters wide and 4.5 deep. 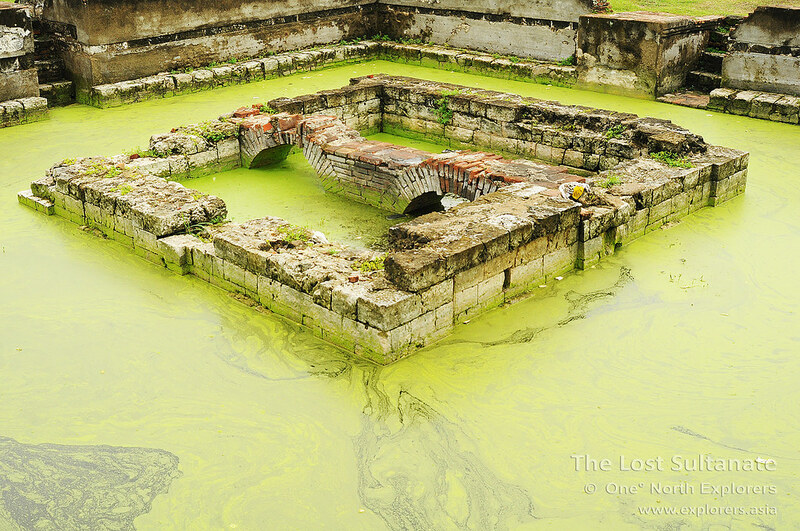 It may look like a toxic cesspool of questionable sludge now but in fact this was the royal bath area for the princesses of Banten. 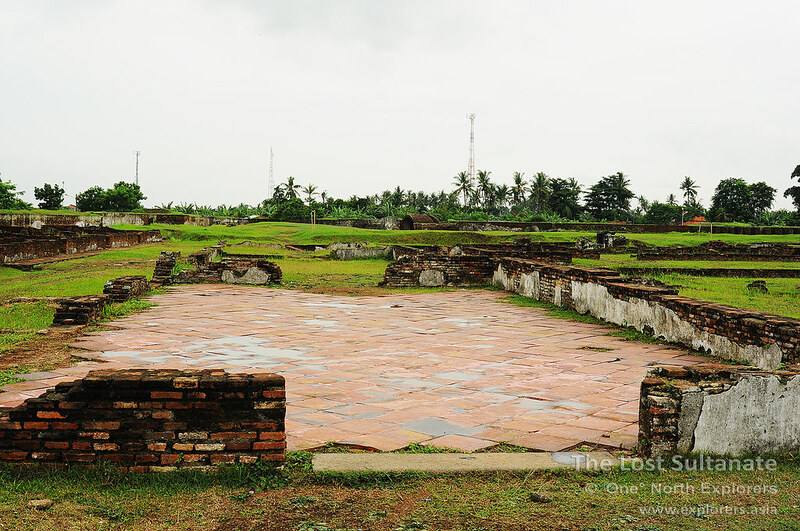 It was known as the Roro Denak and there was a building in the middle known as the Bale Kambang or Floating Hall. Where fresh water once ran, the pool is now algae infested and murky. 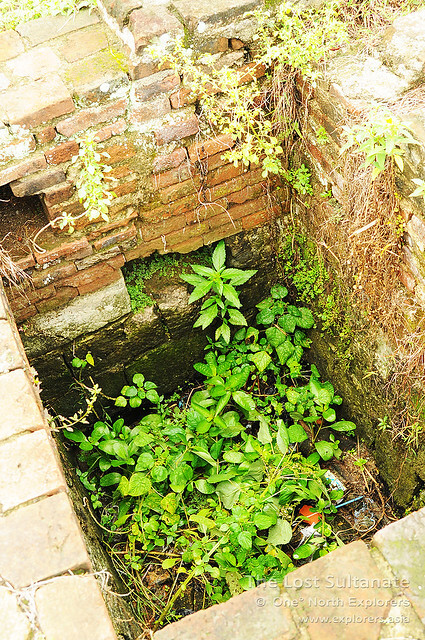 A stone's throw away from the Roro Denak, a pool of a much smaller scale can be found. 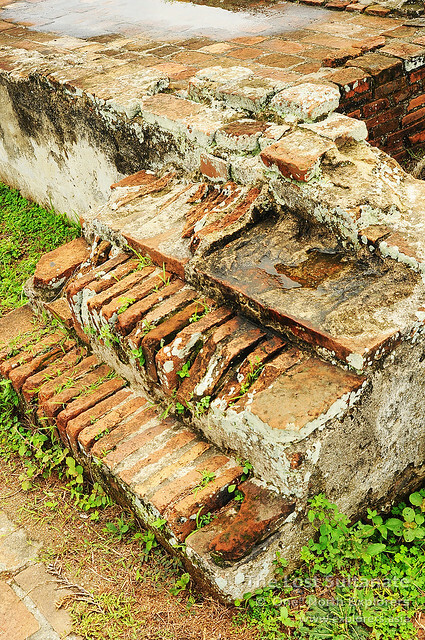 Known as the Pancuran Mas or Golden Fountain, this was the bath area for the palace officials. There used to be copper taps in the area but these have since been removed by looters, who probably stole the taps thinking that they were made of gold due to the misleading name. 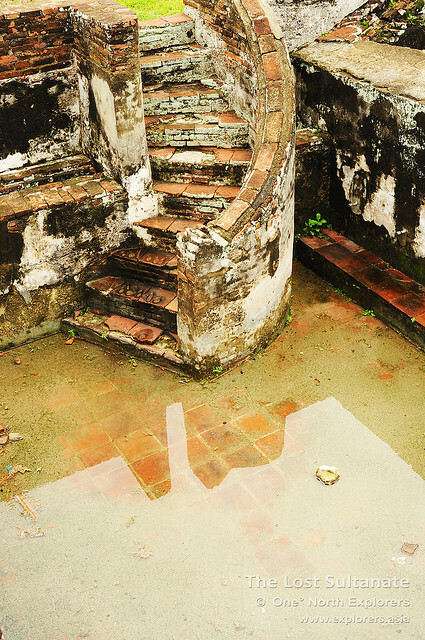 Today, the short flight of stairs lead down to a pool filled with mud and debris. 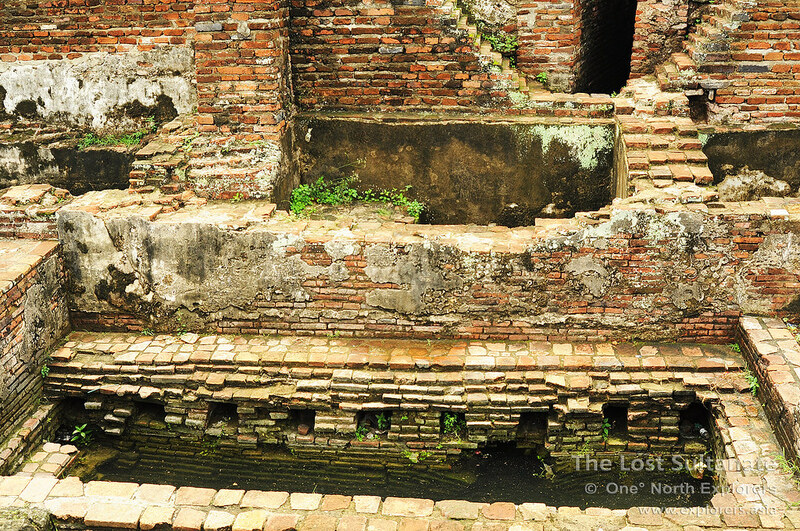 Another water feature lies to the north, a rectangular pool where the Dayang-Dayang or ladies-in-waiting could bathe. 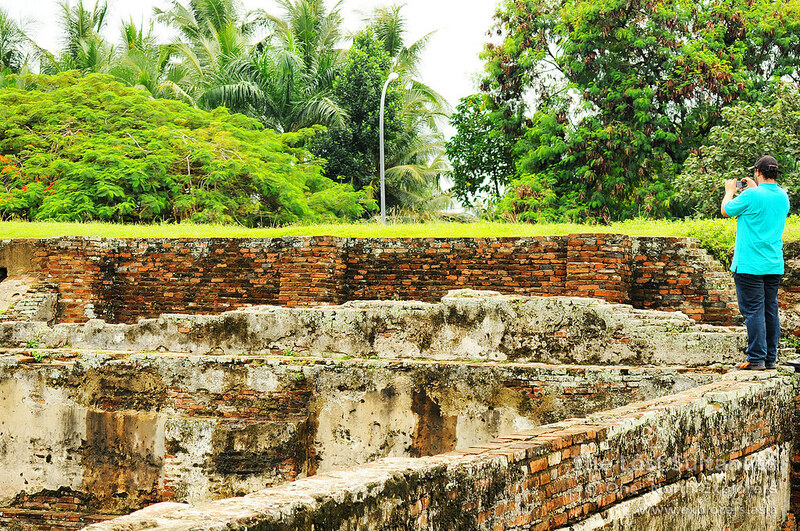 Unlike the Rara Denok, the Dayang-Dayang pool was long and rectangular in shape, and much smaller. Just above the Dayang-Dayang pool was a rather large opening with an arch on top. The opening was a part of the fortification wall and it seemed in lead in from outside. "That's actually the inlet bringing fresh water in from Tasikardi. The water will be purified along the way by three filter houses before it arrives at the palace. Tasikardi was essentially a man-made reservoir serving the needs of the palace." To the west of this, we found a complex network of water troughs which seem to lead into a larger trough below. The way these troughs were placed suggested that they were connected to a catchment point coming from above. If you guessed the roofs, you're absolutely right. 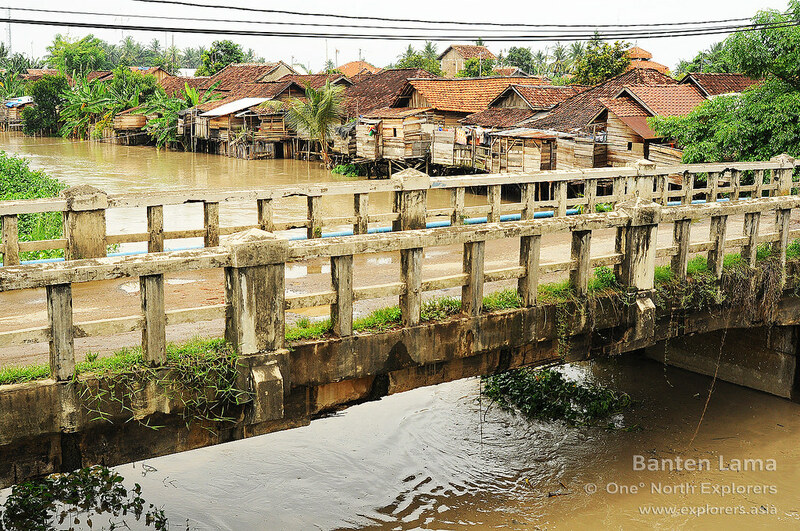 Banten enjoys fairly high precipitation throughout the year so it was a wise idea to harness the rainwater collected from the roofs. 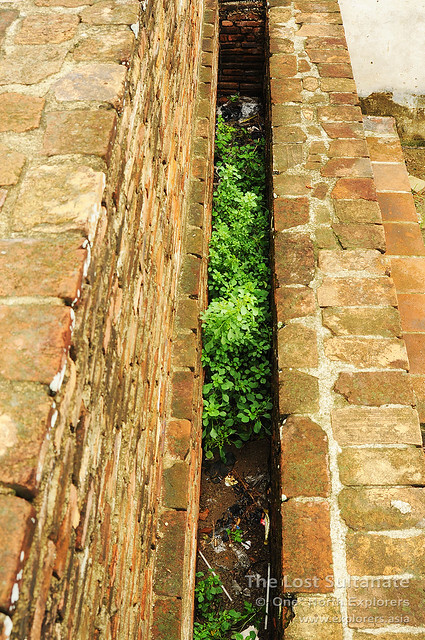 The rainwater would be channeled into bamboo gutters in the roofs and flow into the culverts which lead to larger water troughs for filtration. 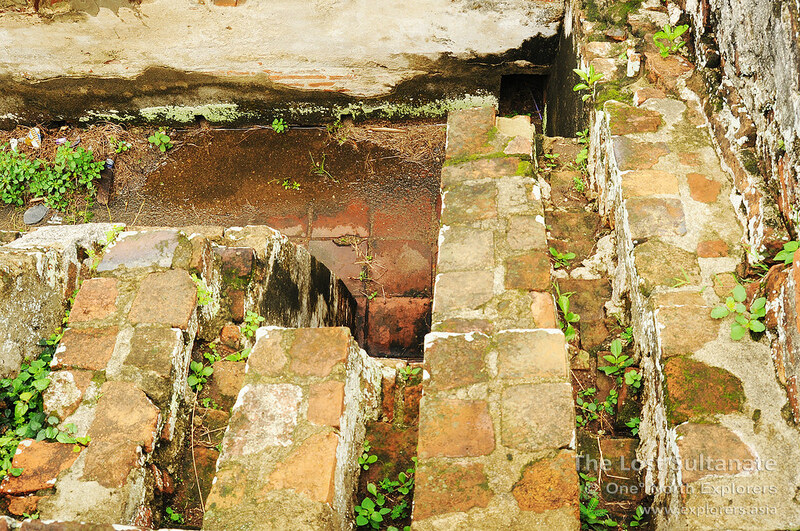 Below the water troughs, we find yet another pool which had a unique curved staircase leading down. 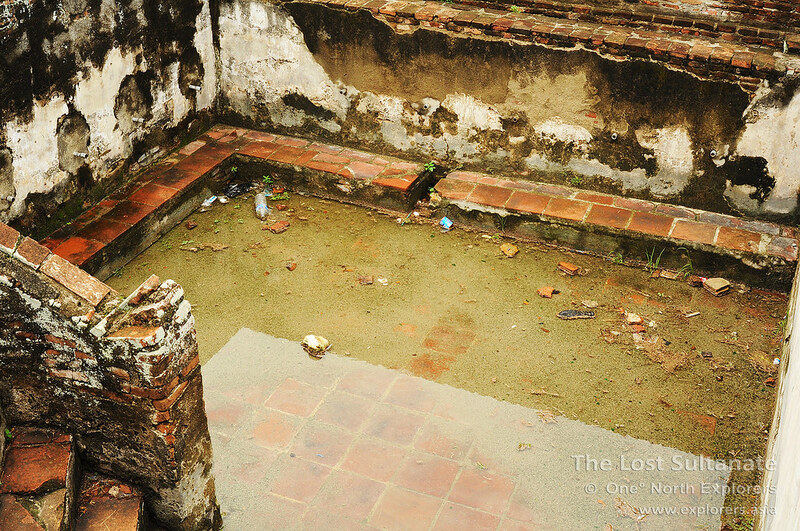 This was the ablution pool where the Sultan would cleanse and purify himself before he carried out his prayers in the prayer hall beside the pool. 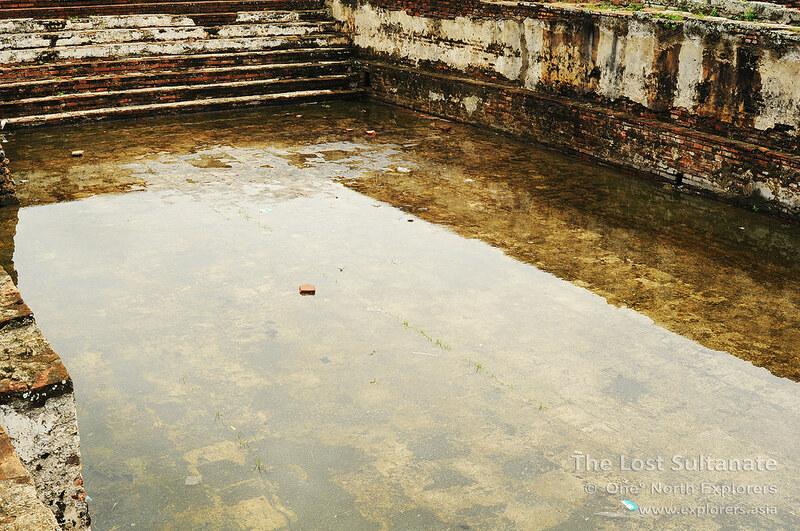 Now, the deserted pool suffers the same fate as Pancuran Mas, waterlogged and filled with rubbish, debris and dirt. As we examined the ablution pool, we came across some metal pipes sticking out from the wall. These modern looking pipes do not seem to fit into the era that the pool was built. Were they added later? What was their function? To fill up the ablution pool when it was dry? It remains a mystery to us. Hardi examines the seemingly modern pipes. The Prayer hall was large and could easily accommodate thirty men. 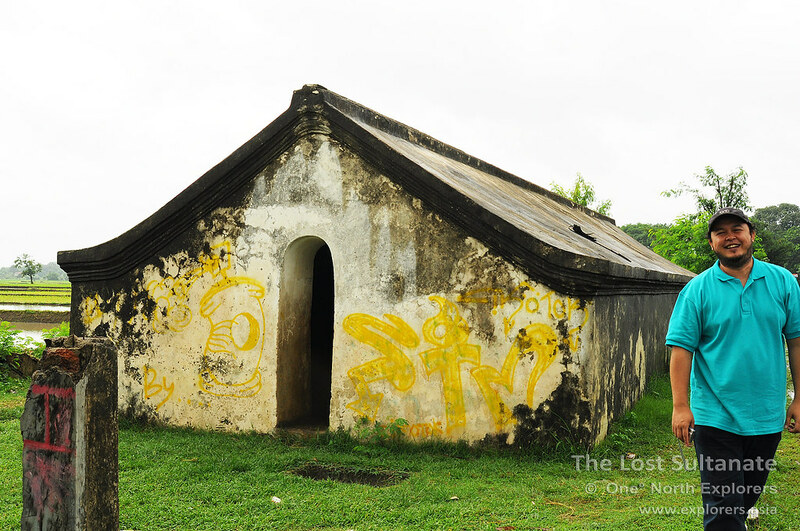 However, this was a private hall reserved exclusively for the Sultan's use. He would conduct his prayers here everyday except for Fridays, where he would join the community at the Masjid Agung (Grand Mosque) on Fridays for their Solat Jumat (Friday Prayers). The prayer hall is located in the northwestern corner of the palace and faces the direction of Mecca. Next to the palace, I was rather surprised to find a perfectly manicured football pitch within the palace walls. "That part has not been excavated yet. Who knows what they might find underneath all that soil in the future?" 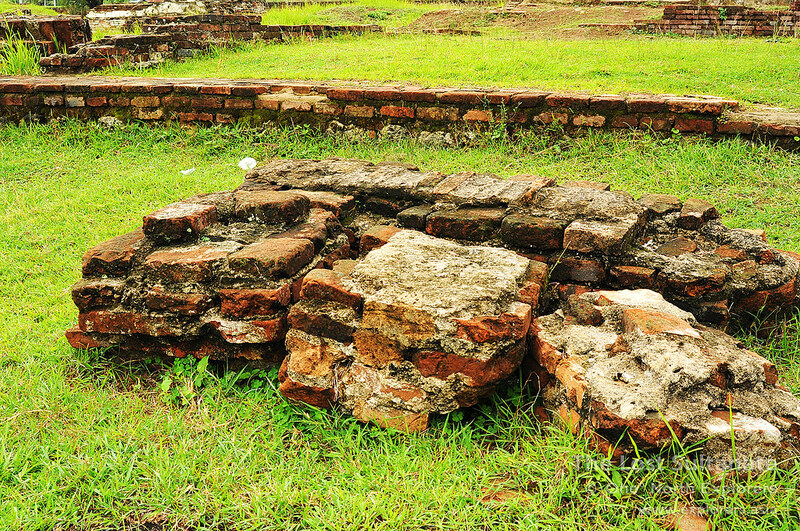 Excavation works were carried out on the palace sometime back but was stopped for unknown reasons. Today the archaeological work on the palace seems half-done it is hard to tell if they would be continued in the future. Until the, this part of the palace remains a football pitch for the local community. 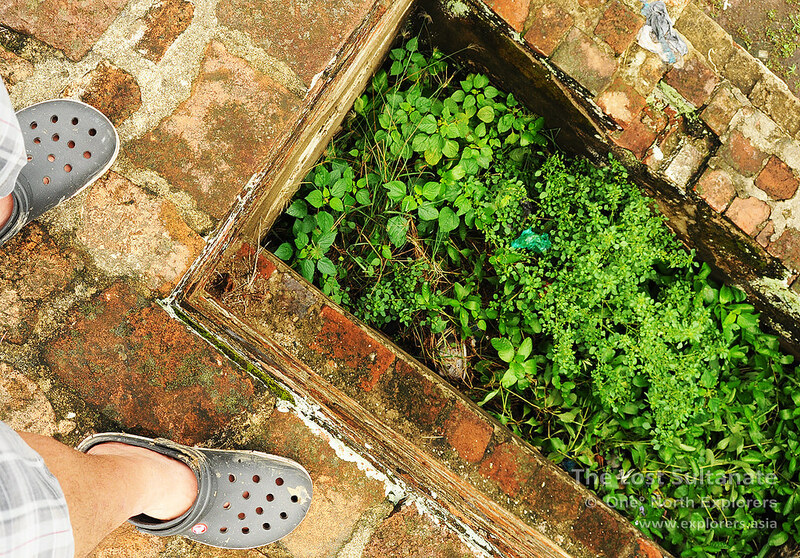 From the prayer hall, we found a way to ascend to the top of the north fortification wall. 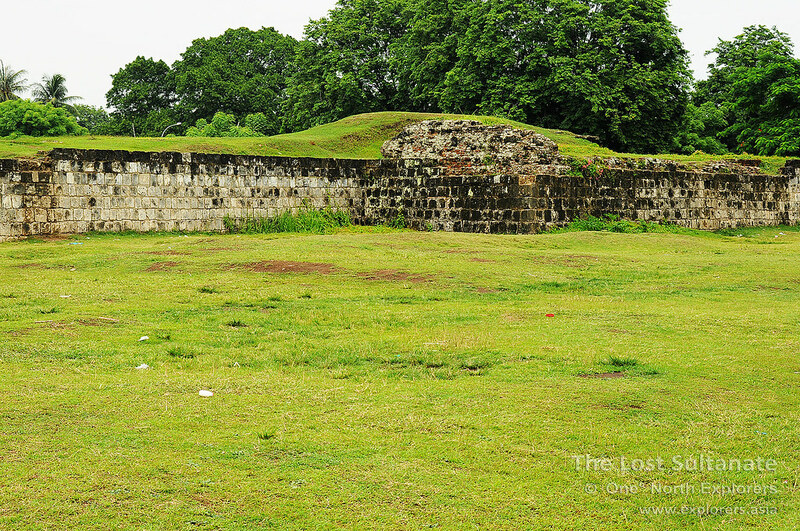 The fortification walls of the palace were definitely thick enough to withstand heavy firepower from cannons. The outer and inner walls, which measure 1 metre in width each, both sandwich a buffer layer of earth which measures a whopping 3 metres. Lookout posts on each corner also allowed the palace guards to keep vigil on the surroundings and fire at assailants from higher ground, while the moat kept opposing foot soldiers at bay. View from the top of the north fortification wall. Note the thickness of the wall. 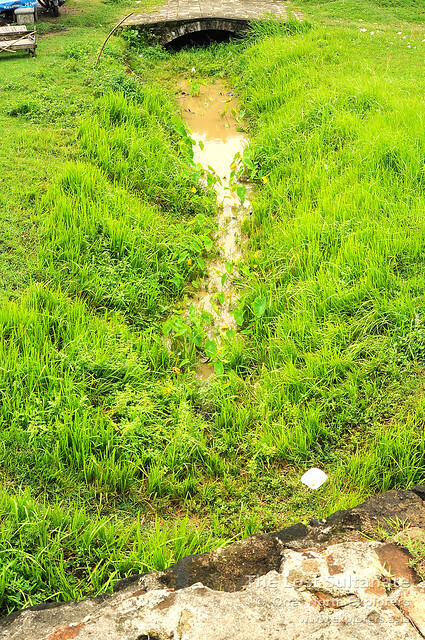 Culvert bringing fresh water in from Tasikardi. A small creek just outside the palace walls. A part of the former moat, perhaps? From our position on the palace walls, it was evident that all traces of the former bastions and the moat have been completely removed. 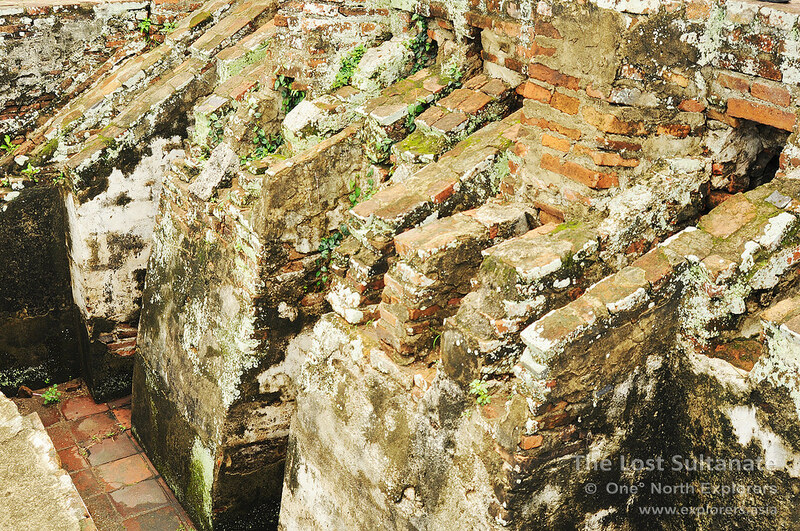 On our way out of the palace, we found a collapsed part of the a building, a wall perhaps? 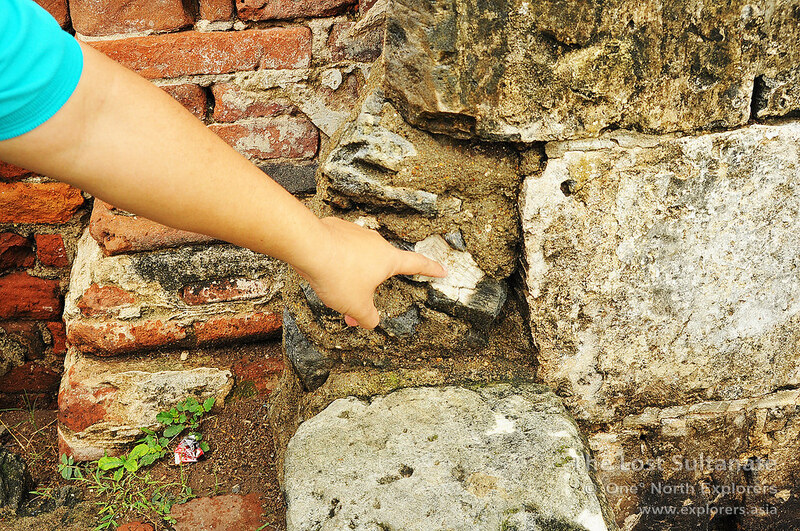 This gives us an idea of how thick the walls of some parts of the palace were. This particular piece measured slightly more than a metre thick. After snapping the last of our pictures of the palace, Hardi and I decided to bid the palace farewell and to move on to our next area of interest, the Masjid Agung and the former town centre of Banten. ...of these guys. They were grazing all over the palace. 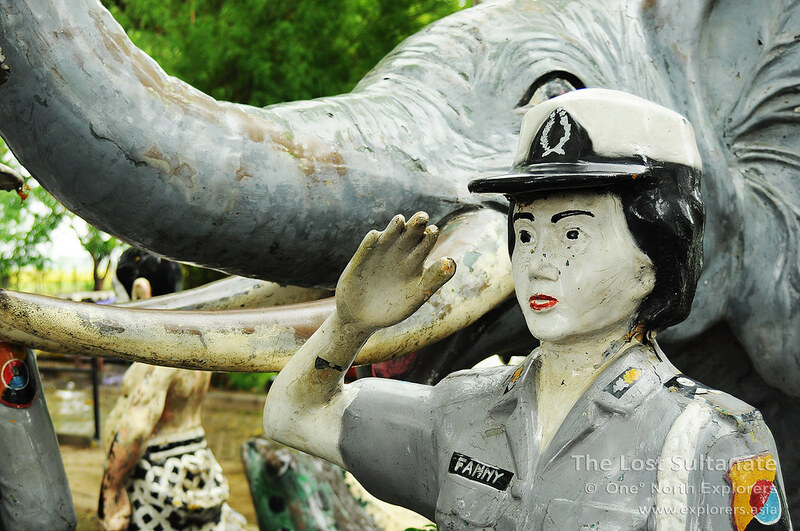 As we exited the forlorn gates of Surosowan Palace, we entered into the bustling marketplace. It was hard to imagine that we had just stepped out of such a deserted and quiet world beyond those iron gates into a busy street lined with stalls on both sides. 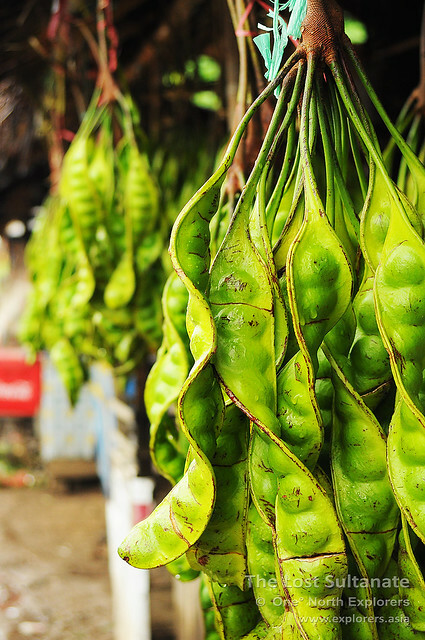 Hawkers were peddling everything from fried food, fruits, clothing toys and even obat kuat, a questionable medicine which claims to strengthen men's performance. 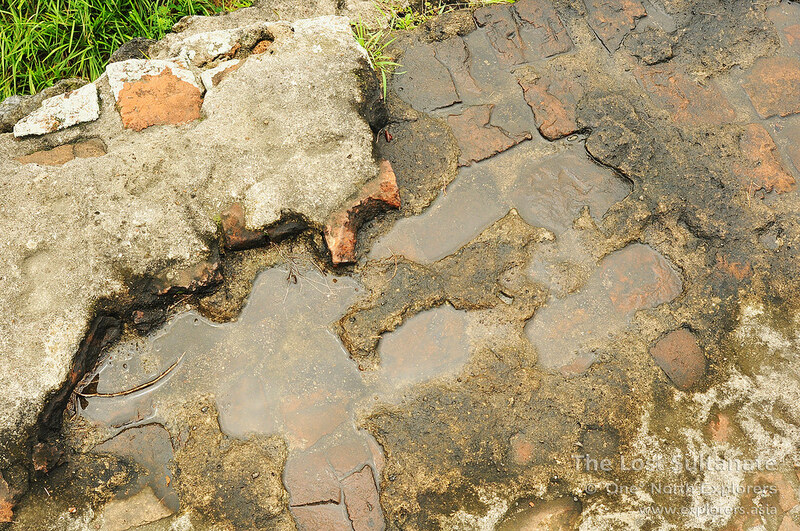 The inner reaches of the marketplace were not properly paved and the ground, which had been exposed to the rain earlier, had turned into a muddy mess. 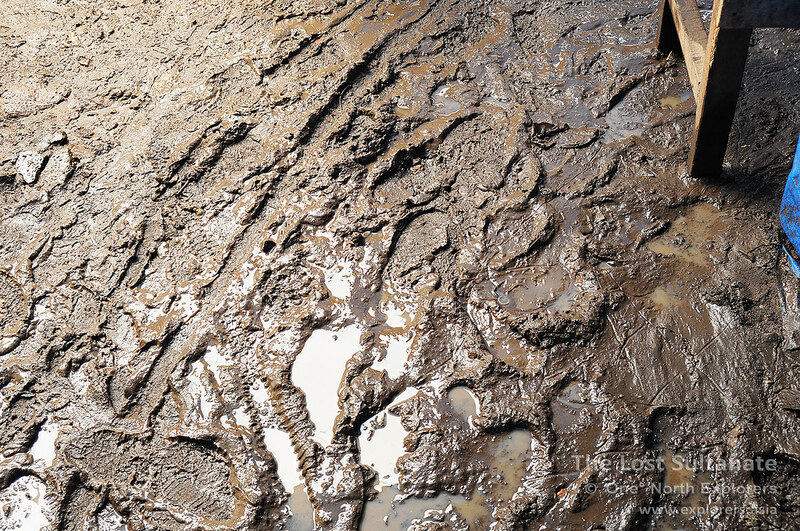 It was slippery and the mud was ankle deep in some parts, an absolute nightmare to walk on. Some enterprising kids started handing out plastics bags for a thousand rupiah each - the locals who bought them simply took off their shoes, placed them in the bags and walked barefoot in the mud. 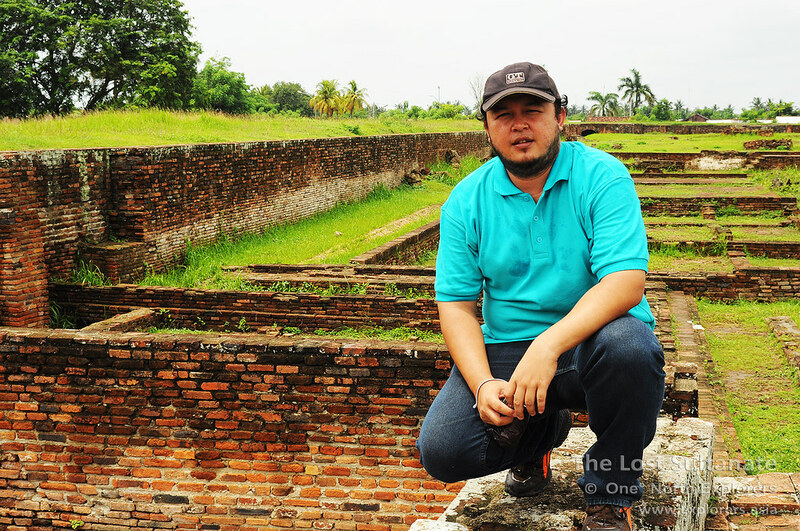 After the muddy experience, we soon arrived at the side of the Grand Mosque of Banten (Masjid Agung Banten Lama). The first thing I noticed was the unique minaret. It looks exactly like a lighthouse! With the sea only a short distance away, the octoganal minaret was a lookout point during the old days, apart from being a focal point and to provide the call for prayer. Curiously, it was also used as an armoury where weapons were stored. 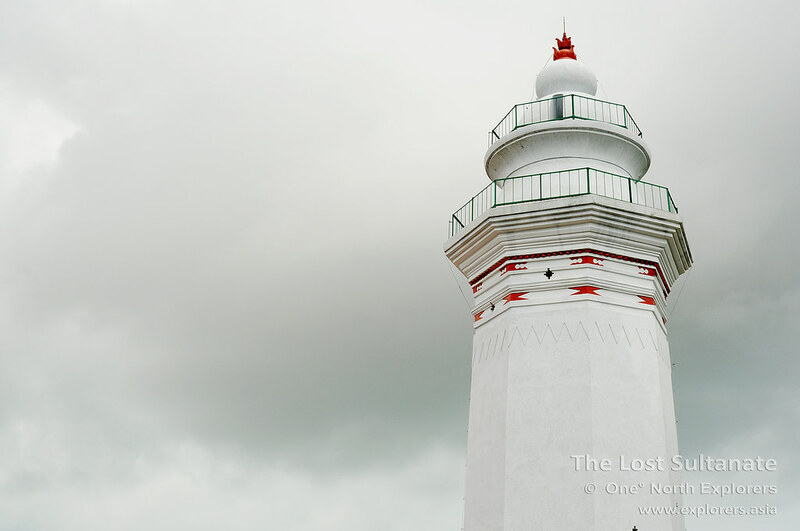 The lighthouse was designed by Hendrik Lucasz Cardeel, the same person who proposed and designed the European-inspired features of Surosowan Palace. 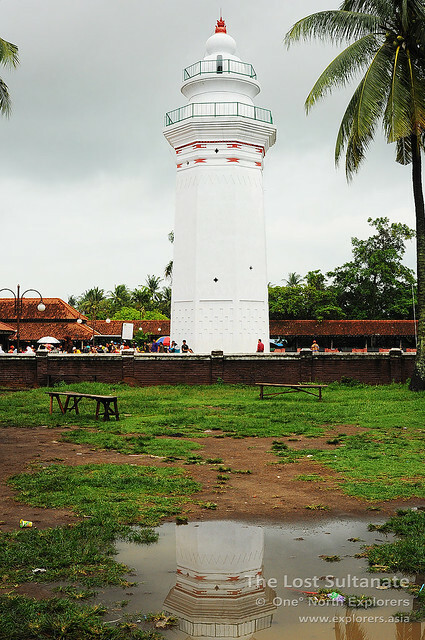 The minaret is a twenty four metre brick tower and one could ascend a narrow staircase to the top where interesting views of Banten could be had. However, the minaret was closed from the public today as there was a prayer session going in inside the mausoleum area. The place was simply jam-packed with people today. The entrances to the prayer hall are slightly shorter than normal and most people have to bend their heads when they entered the mosque. The design is believed to be ordered by Sultan Maulana Hasanuddin and it ensures that everyone entering the prayer hall will bend and bow their heads, therefore showing a humble gesture of respect for the holy place. 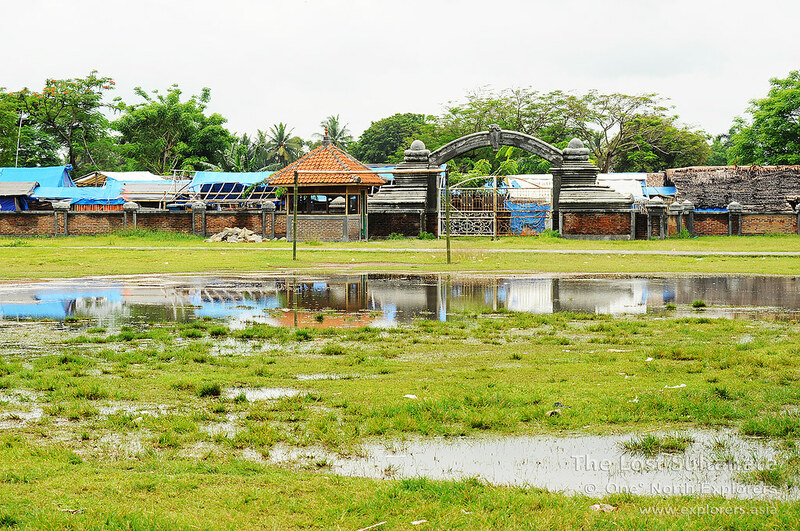 The ablution pools of Masjid Agung. The Grand Mosque of Banten was established according to the traditions of the past, which states that there should be four components in an Islamic city. First of all, there should be a Palace as the seat of government and a residence for the Sultan, a duty which was duly fulfilled by Surosowan Palace. Secondly, there should be a mosque where the subjects could congregate for worship. Thirdly, there should be a town square which acted as the center of activity and for passing out information. And last but not least, there should be a market for economic activity. Out of the four components, only the Grand Mosque and the market remain in the present day to give us a glimpse of Banten's illustrious past. The main mosque building and the minaret have been around since the time of Sultan Maulana Hasanuddin, and the north and south wings were added later. It is said that the construction of the Grand Mosque stemmed from Sunan Gunungjati's instructions to his son, Maulana Hasanuddin. 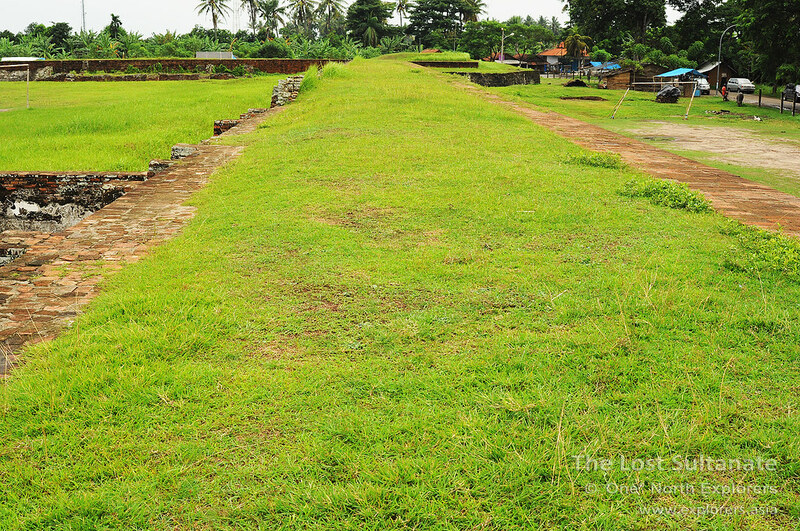 The latter was asked to find a piece of land that was sacred on which to develop the Sultanate of Banten on. Hasanuddin was on board a ship off the coast of Java when he prayed for divine help to assist him in his task. After his prayers, the waves spontaneously pushed his ship onto Banten Girang. 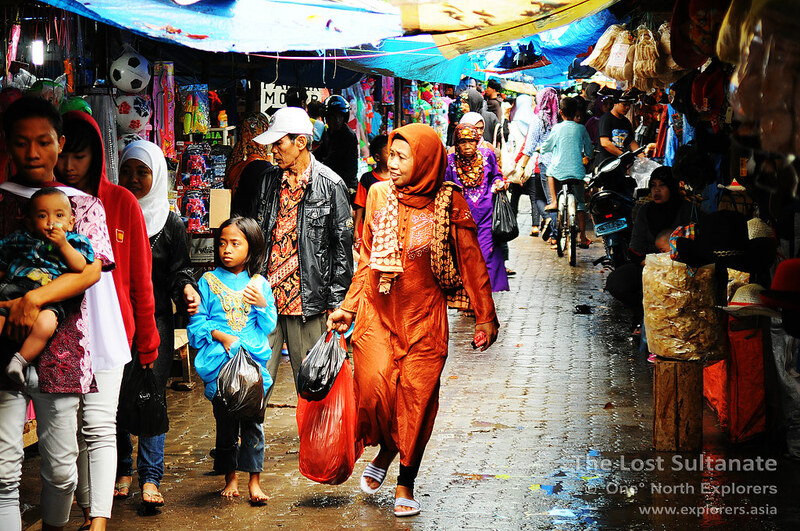 Hasanuddin began to establish the Kingdom of Banten and its other components as a result of this event. Sundial previously used by the Imams to tell the time to call for prayers. The gnomon (shadow casting object) is missing, rendering it purely ornamental now. On the southern side of the mosque, a contemporary Dutch-style rectangular tiyamah (Pavilion) was used as an important meeting place. Today the building functions as a museum of relics. On the northern side, the royal graveyard and mausoleum - where a long list of Sultans were buried, among them Sultan Maulana Hasanuddin and his queen; Sultan Ageng Tirtayasa and Sultan Haji - can be found. 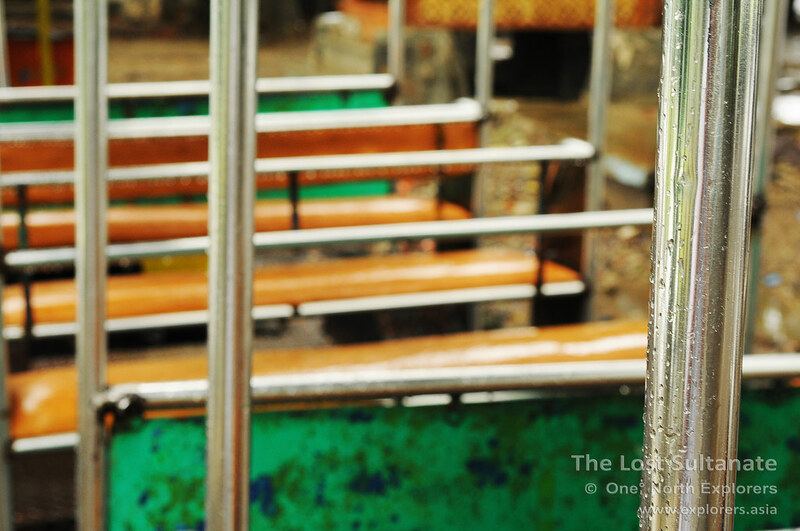 The royal mausoleum is a popular place for pilgrims who travel there to pray for the Sultan. It is believed that those who do so, will be blessed with good fortune. Judging by the long queue, I could see the true faith of the sheer droves of people who had come from afar to offer their prayers. 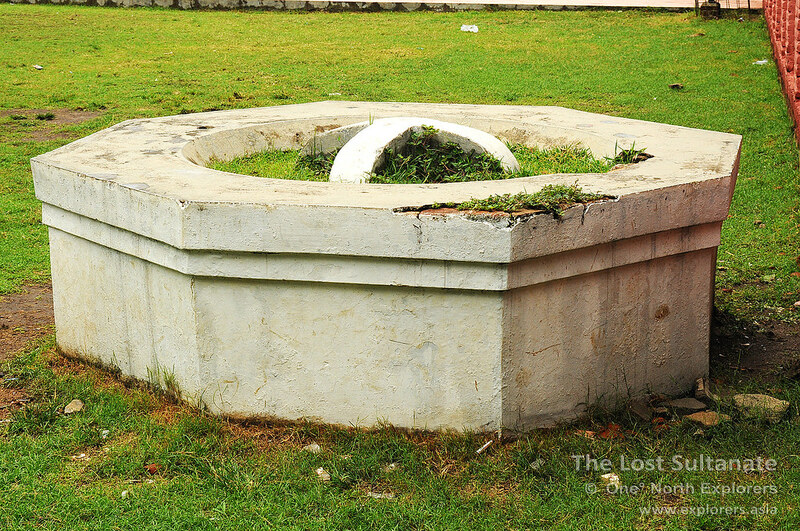 Unlike other mosques in Java where the mosque's founder's tomb is located in the west by tradition, Sultan Maualana Hasanuddin's tomb is located on the north side of the mosque. Prayers were going on in the royal mausoleum so I had to snipe from afar. 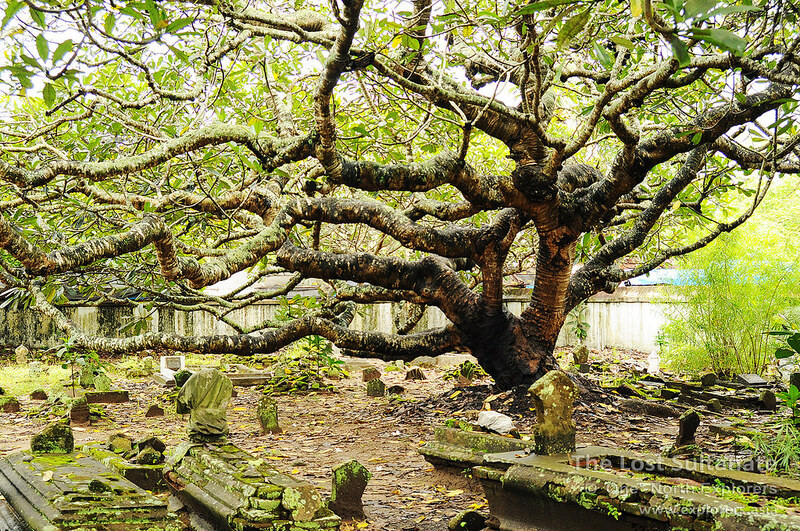 That creepy old tree looks right at home in the royal graveyard. We headed east in the direction of the former town square as we departed the mosque. There was a large gateway demarcating the entrance to the town square and where a waterlogged football pitch with makeshift goalposts stands now. (These people sure love football.) 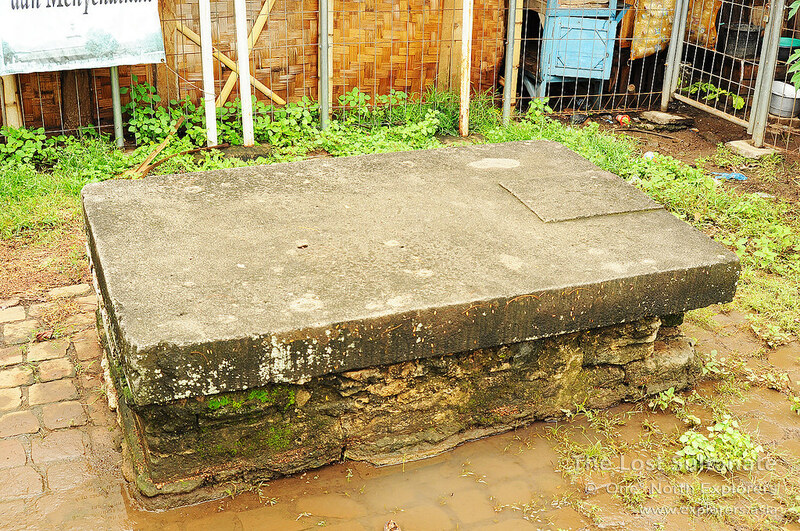 Another important part of Banten's history, gone and probably never coming back. 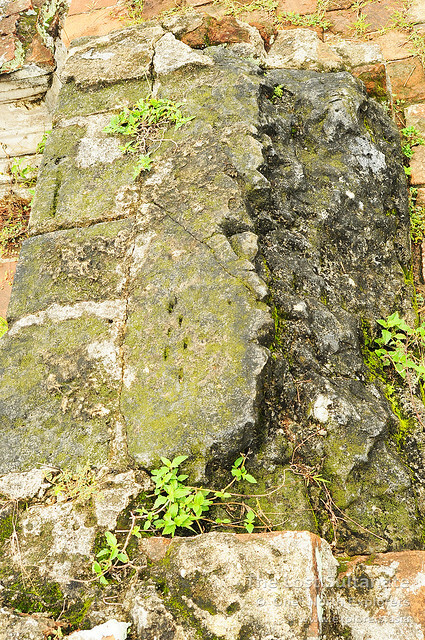 Another interesting relic we wanted to check out before we left the town centre was the Watu Gilang or Stone of Gilang. This stone was used as a ceremonial throne during the swearing in of each new Sultan. 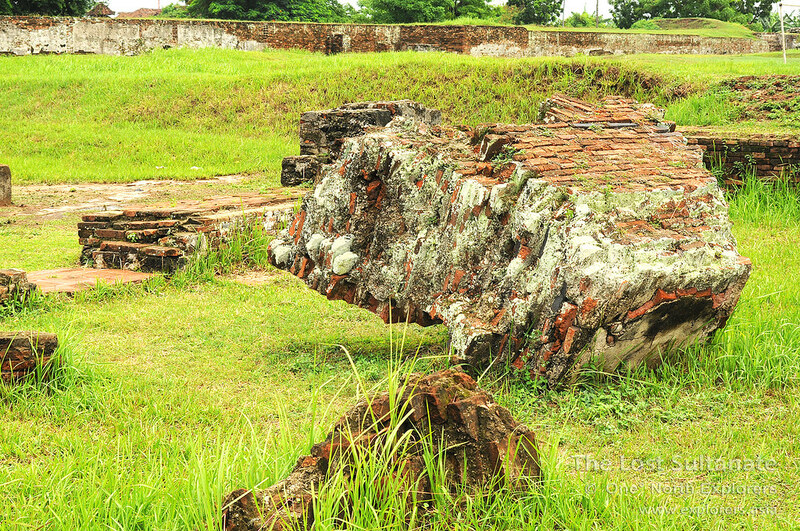 Legend states that the stone once belonged in Pakuan, the capital city of the Sunda Kingdom. When the Sundanese were defeated by the Sultanate of Banten, the stone was brought back to Banten by Sultan Maulana Hasanuddin under the orders of his father. The stone was believed to have mystical powers and helped to bring wealth and prosperity to any kingdom which owned it. This seemed to be true for Banten as they expanded their vast empire upon placing this stone in their Sultanate. However, it is also said that the stone should not be moved, for misfortune would befall on the Sultanate and it come to a swift and tragic end. 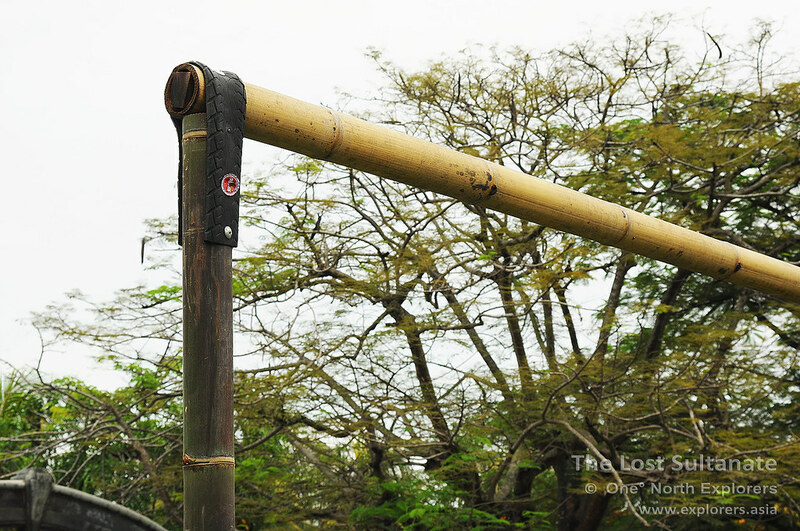 The Watu Gilang was used for swearing in purposes between the second to the sixth Sultan, while a second stone called the Watu Singayaksa, located not too far away from here, was used from the seventh Sultan onwards. The stone is a precious piece of history and mysticism indeed, but today it lies neglected amongst the various stalls, often ending up as the bed of a stray cat or dog. From this position, we decided to take a walk to Tasikardi, which was about two kilometres away from the town centre. 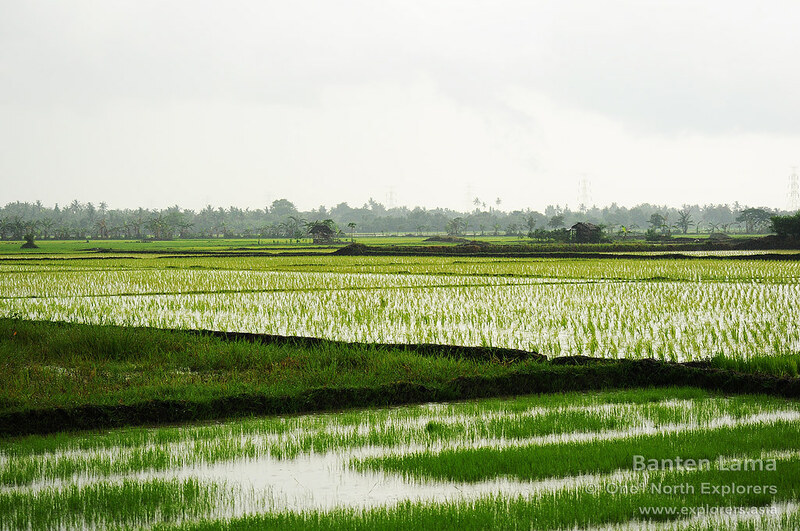 Soon enough, we were away from the hustle and bustle of the market and surrounded by rice fields. As we walked along, Hardi explained the workings of Surosowan Palace's water filtration system. 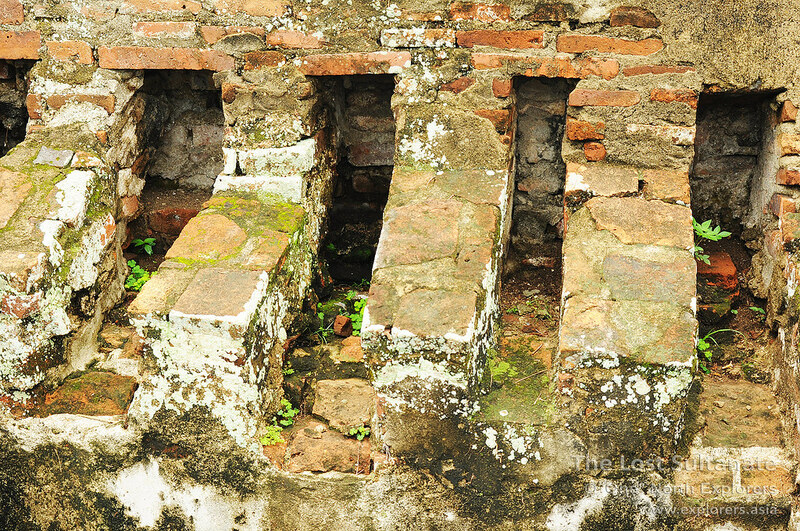 "The water from Tasikardi is channeled via clay pipes through three filter houses, namely Pengindelan Abang (Red Filter), Pengindelan Putih (White Filter) and Pengindelan Emas (Gold Filter) along the way to the palace. The water from Tasikardi will pass through Pengindelan Abang and be certified red quality, afterwhich it passes through Pengindelan Putih and becomes white quality, and finally through Pengindelan Emas where it becomes clear and certified gold quality." We soon arrived at a building which stood out lie a sore thumb among the rice fields. "This, my friend, is Pengindelan Abang." said Hardi. The building was very long and it had a conventional roof which made it look like a house. 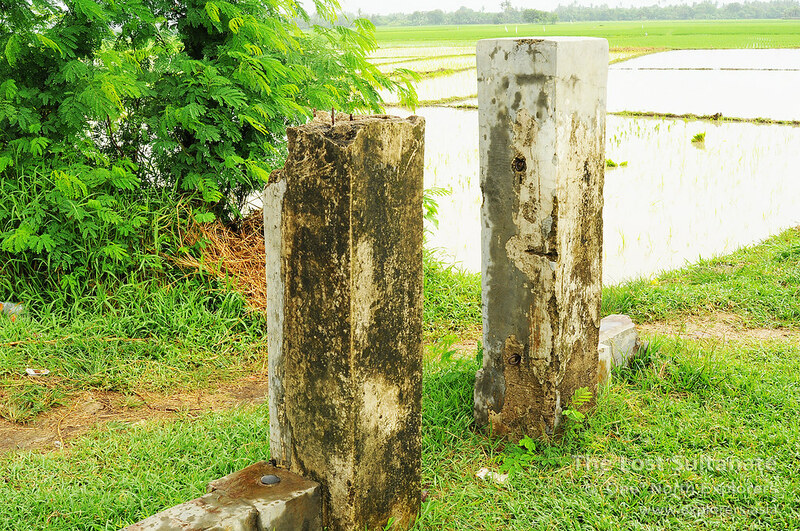 Former gate posts of Pengindelan Abang. The area used to be fenced up during the Sultanate's reign. As we stood outside the solitary entrance to the filter house,I could hear an incessant cacophony of screeching inside. "Bats?" I asked. Before Hardi could answer, one of the cretins flew past our heads into the entrance. Hardi grinned at me with a "I think that just answered your question" kind of look. I stood at the doorway and looked into the filter house. The entire bottom area was flooded as expected due to the building's primary function. There was rubbish floating in the water and the stench was horrible. I took a couple of shots of the interior and ended up with these. The water was brown, stagnant and probably teeming with millions of bacteria. The interior does look like an air raid shelter. A couple of bats were startled by my camera's flash and flew further into the filter house. The screeching became louder when the bats detected the presence of humans "invading" their nest. Soon, it was Hardi's turn to shoot the interior of the building. After Hardi's turn to shoot the interior (which barely lasted a minute) we continued our walk to Tasikardi. Hardi seemed visibly happy to get away from the rank stench of the filter house. Trust me, the smell was overwhelming. Hardi was happy to get away from the filter house. 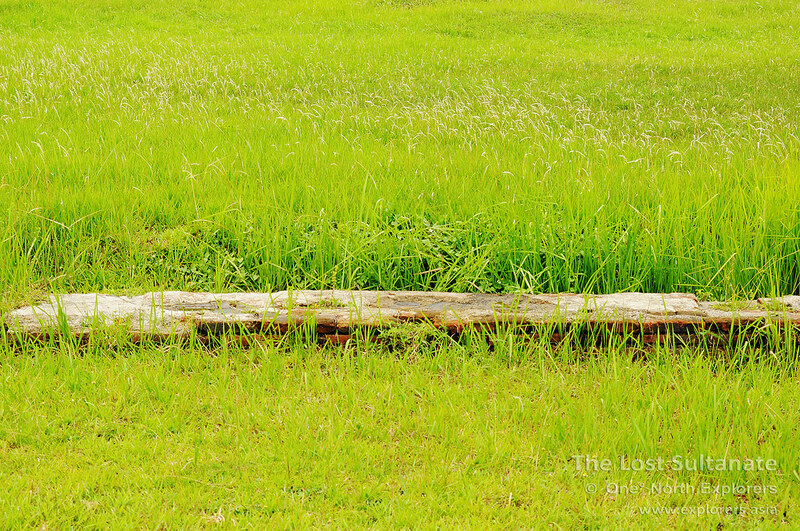 We continued our walk among the rice fields, and before long, I could see a row of trees lined neatly ahead of us. "Is that the one?" I asked, to which Hardi nodded with a smile. It was hard to miss features like these when all you had around you was miles and miles of flat rice fields. 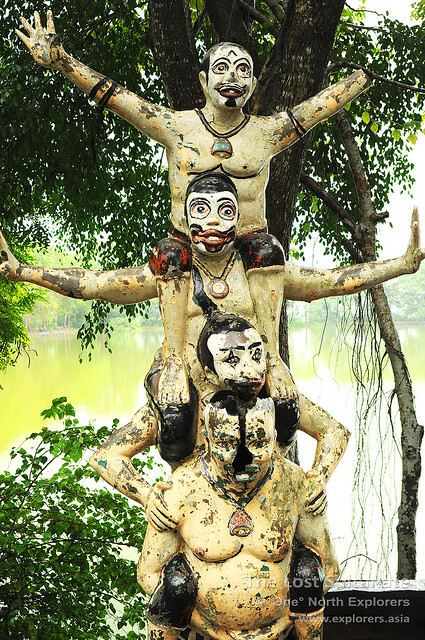 In perhaps a foolhardy attempt to spruce up the surroundings of the place, there were several statues placed near the entrance to add colour to the lake. There was a gray elephant, decapitated statues of Mickey Mouse and Donald Duck, and these guys below. "We welcome you with open arms!" Pity the guy below has a splitting headache. 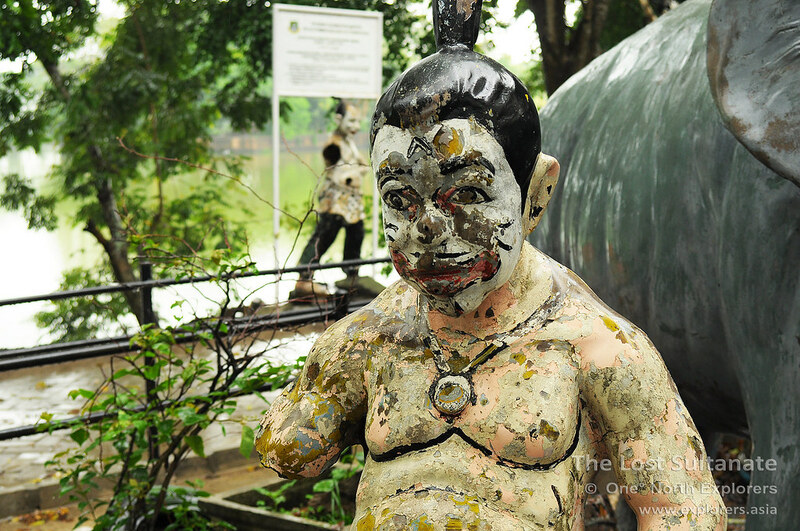 These curious looking statues are actually the Purnakawan. Hardi explains that they are popular characters in Wayang Kulit (Javanese shadow theatre, an arcane art form practiced and loved by many in Java) who appear in many stories. 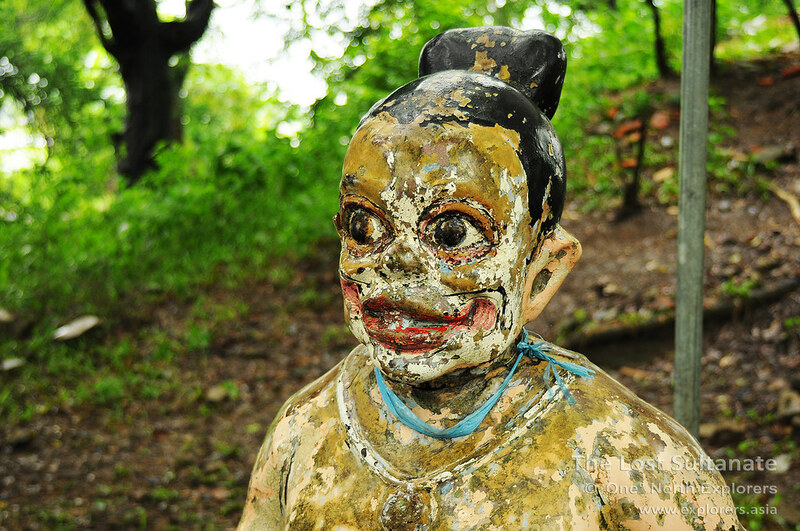 They are known as the clown servants of the protagonist and their appearance was always anticipated by wayang kulit audiences. 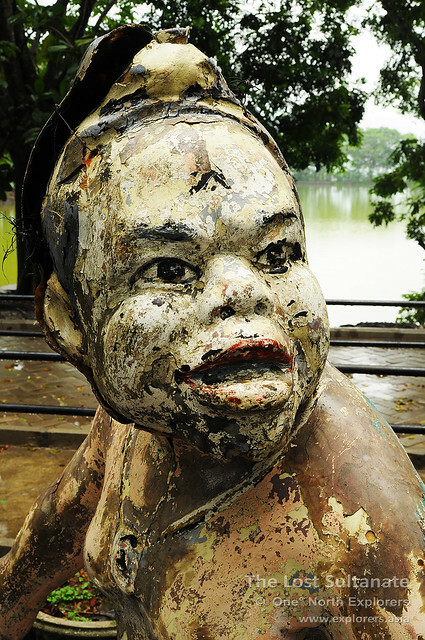 Like the rest of the statues, they were in various stages of decay. Most were missing an arm or a leg, while some had their brains split open. It was not a pretty sight. 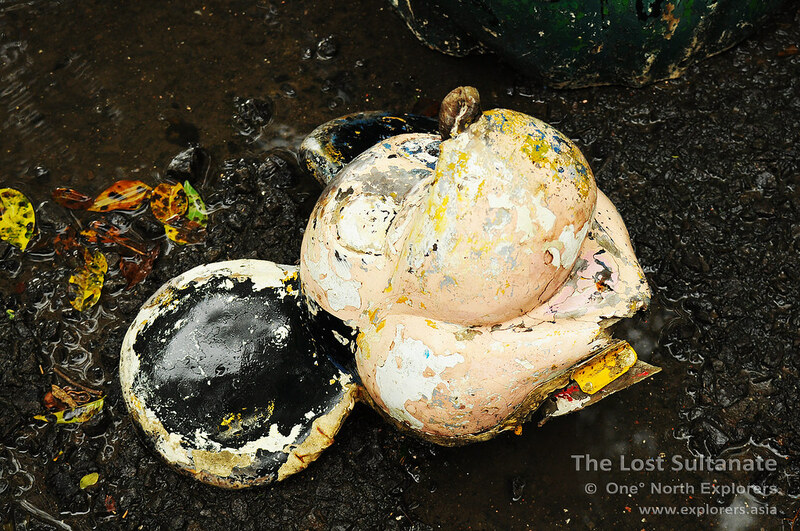 If the intention of putting these statues was to beautify the place, it certainly was not helping at all. Fanny - not a good name at all. Moving on from the statues, we walked over to the bank where we could get a clear shot of the man-made island in the middle of the lake. Measuring exactly 44 metres by 44 metres, the island was a recreational area for the Sultans and it houses a pleasure pavilion and the ruins of a royal bathroom. The name Tasikardi stands for artificial lake in Sundanese and Hardi explains that Tasikardi was built for one simple reason - to provide a source of clean water. Back in the old days, foreign vessels would call at Banten and most of the time, the crew on board would pass some diseases to the local community after being at sea for months on end. Since the locals lived in slums, it was hard to contain such diseases. 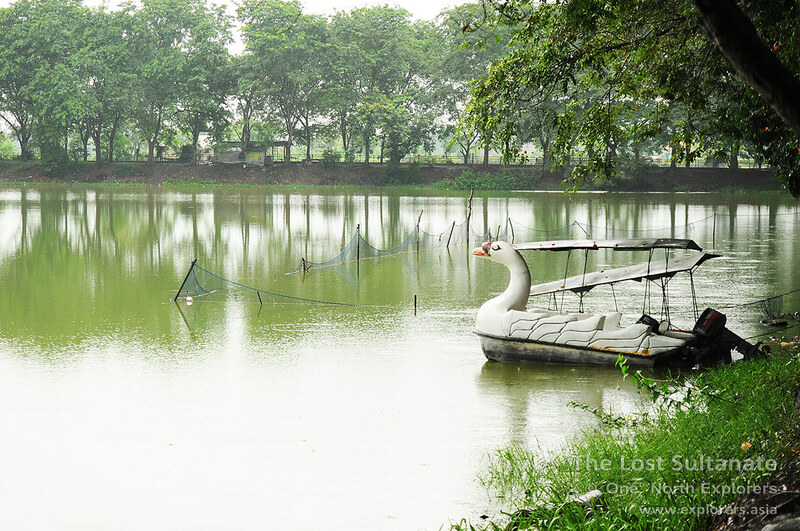 Hence, Sultan Maulana Hasanuddin decided to build a lake far from the town where he could draw clean water from. 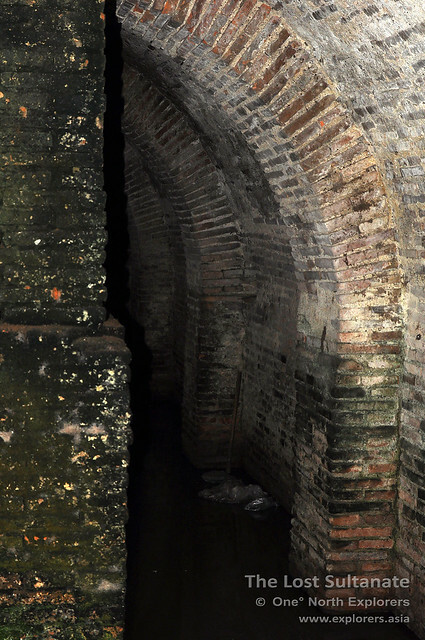 The water supplied to the palace was through enclosed clay pipes so there was no way the water could be contaminated. Tasikardi is believed to be never dry and never overflowing, and this has seemingly held true for the last few centuries. 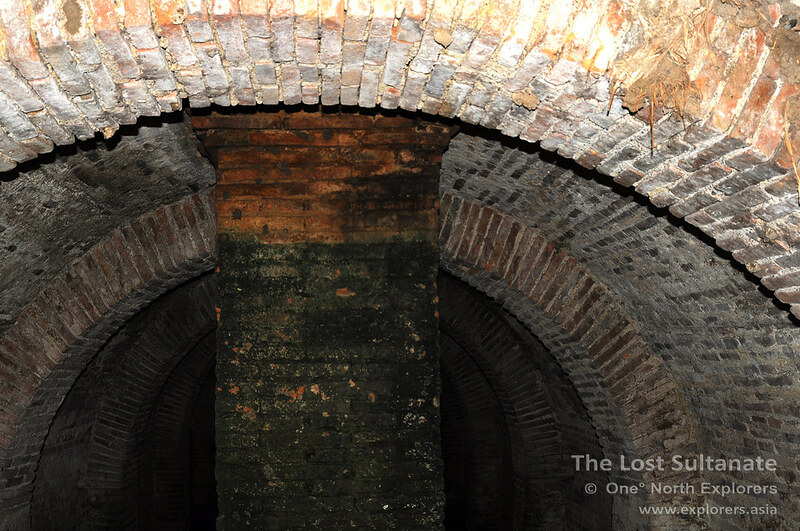 The bottom of the lake is flat and lined with the same red bricks used in the construction of Surosowan Palace. A weary caretaker approaches us and asks if we would like to rent a boat to the island. Looking at the light drizzle and occasional streak of lightning, we politely declined. As much as we'd like to document the island, the thought of being stuck on an island in the middle of a thunderstorm was not appealing at all. I understand that this used to be a popular place where there were various food and game stalls available and one could partake in several recreational activities in the lake, such as paddle boats, but due to a decline in business, these proprietors have since left. The whole place feels empty and dead. 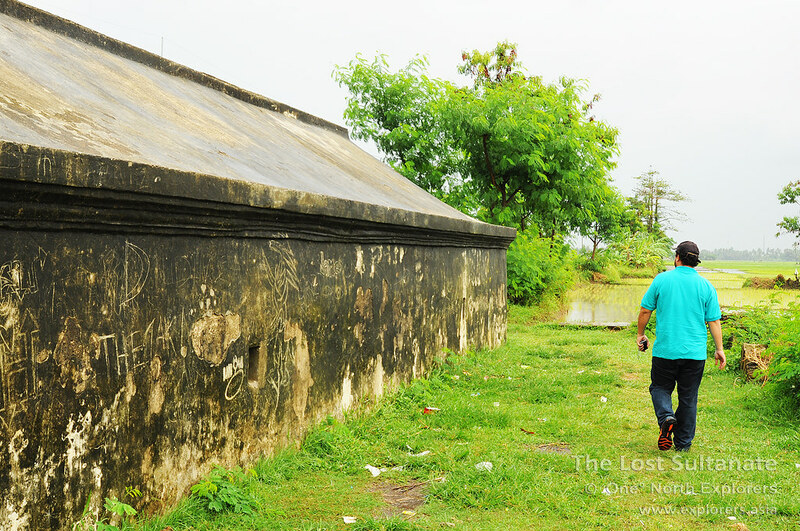 It was sad to see such places of historical significance being neglected like such. 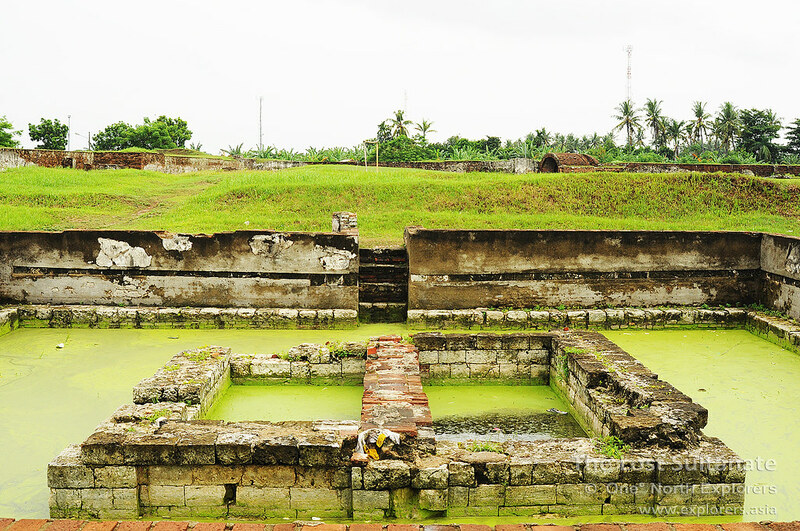 Surosowan Palace, Tasikardi, the former town square of Banten and even the three filter houses all played an importnat part in creating the first building blocks of Islam in Indonesia. As I boarded the car for my next destination, I said a little prayer for the lake. I hope the authorities can do something about the restoration of these places and although I know that the hope is dim, I'm keeping my fingers crossed.